You know, in science, there was once this thing we called the Theory of Multiple Working Hypotheses. Anathema (a formal ecclesiastical curse accompanied by excommunication) in modern climate science. So, in juxtaposition to the hypothesis of future global climate disruption from CO2, a scientist might well consider an antithesis or two in order to maintain ones objectivity. One such antithesis, which happens to be a long running debate in paleoclimate science, concerns the end Holocene. Or just how long the present interglacial will last. Looking at orbital mechanics and model results, Loutre and Berger (2003) in a landmark paper (meaning a widely quoted and discussed paper) for the time predicted that the current interglacial, the Holocene, might very well last another 50,000 years, particularly if CO2 were factored in. This would make the Holocene the longest lived interglacial since the onset of the Northern Hemisphere Glaciations some 2.8 million years ago. Five of the last 6 interglacials have each lasted about half of a precession cycle. The precession cycle varies from 19-23k years, and we are at the 23kyr part of the range now, making 11,500 years half, which is also the present age of the Holocene. Which is why this discussion has relevance. But what about that 6th interglacial, the one that wasn't on the half-precessional "clock". That would be MIS-11 (or the Holsteinian) which according to the most recently published estimate may have lasted on the order of 20-22kyrs, with the longest estimate ranging up to 32kyrs. "Recent research has focused on MIS 11 as a possible analog for the present interglacial [e.g., Loutre and Berger, 2003; EPICA community members, 2004] because both occur during times of low eccentricity. The LR04 age model establishes that MIS 11 spans two precession cycles, with 18O values below 3.6o/oo for 20 kyr, from 398-418 ka. In comparison, stages 9 and 5 remained below 3.6o/oo for 13 and 12 kyr, respectively, and the Holocene interglacial has lasted 11 kyr so far. In the LR04 age model, the average LSR of 29 sites is the same from 398-418 ka as from 250-650 ka; consequently, stage 11 is unlikely to be artificially stretched. However, the June 21 insolation minimum at 65N during MIS 11 is only 489 W/m2, much less pronounced than the present minimum of 474 W/m2. In addition, current insolation values are not predicted to return to the high values of late MIS 11 for another 65 kyr. We propose that this effectively precludes a 'double precession-cycle' interglacial [e.g., Raymo, 1997] in the Holocene without human influence." "On balance, what emerges is that projections on the natural duration of the current interglacial depend on the choice of analogue, while corroboration or refutation of the "early anthropogenic hypothesis" on the basis of comparisons with earlier interglacials remains irritatingly inconclusive." Figure 2. Tzedakis (2010) comparing the Holocene with the previous 4 interglacials. An astute reader might have gleaned that even on things which have happened, the science is not that particularly well settled. Which makes consideration of the science being settled on things which have not yet happened dubious at best. As we move further towards the construction of the antithetic argument, we will take a closer look at the post-MPT end interglacials and the last glacial for some clues. Higher resolution proxy studies from many parts of the planet suggest that the end interglacials may be quite the wild climate ride from the perspective of global climate disruption. "In terrestrial records from Central and Eastern Europe the end of the Last Interglacial seems to be characterized by evident climatic and environmental instabilities recorded by geochemical and vegetation indicators. The transition (MIS 5e/5d) from the Last Interglacial (Eemian, Mikulino) to the Early Last Glacial (Early Weichselian, Early Valdai) is marked by at least two warming events as observed in geochemical data on the lake sediment profiles of Central (Gro¨bern, Neumark - Nord, Klinge) and of Eastern Europe (Ples). Results of palynological studies of all these sequences indicate simultaneously a strong increase of environmental oscillations during the very end of the Last Interglacial and the beginning of the Last Glaciation. This paper discusses possible correlations of these events between regions in Central and Eastern Europe. The pronounced climate and environment instability during the interglacial/glacial transition could be consistent with the assumption that it is about a natural phenomenon, characteristic for transitional stages. Taking into consideration that currently observed ''human-induced'' global warming coincides with the natural trend to cooling, the study of such transitional stages is important for understanding the underlying processes of the climate changes." "The geology of the Last Interglaciation (sensu stricto, marine isotope substage (MIS) 5e) in the Bahamas records the nature of sea level and climate change. After a period of quasi-stability for most of the interglaciation, during which reefs grew to +2.5 m, sea level rose rapidly at the end of the period, incising notches in older limestone. After brief stillstands at +6 and perhaps +8.5 m, sea level fell with apparent speed to the MIS 5d lowstand and much cooler climatic conditions. It was during this regression from the MIS 5e highstand that the North Atlantic suffered an oceanographic ''reorganization'' about 118.73 ka ago. During this same interval, massive dune-building greatly enlarged the Bahama Islands. Giant waves reshaped exposed lowlands into chevron-shaped beach ridges, ran up on older coastal ridges, and also broke off and threw megaboulders onto and over 20 m-high cliffs. The oolitic rocks recording these features yield concordant whole-rock amino acid ratios across the archipelago. Whether or not the Last Interglaciation serves as an appropriate analog for our ''greenhouse'' world, it nonetheless reveals the intricate details of climatic transitions between warm interglaciations and near glacial conditions." Figure 3. Rapid Sea Level Spike at the end of MIS-5, the Eemian. and Figure 4 (figure 5 in their study). Figure 4. The MIS-5e notch (photo A) and modern notch (photo B) (Hearty and Neumann, 2001, figure 5). The picture which emerges is that the post-MPT end interglacials appear to be populated with dramatic, abrupt global climate disruptions which appear to have occurred on decadal to centennial time scales. Given that the Holocene, one of at least 3, perhaps 4 post-MPT "extreme" interglacials, may not be immune to this repetitive phenomena, and as it is half a precession cycle old now, and perhaps unlikely to grow that much older, this could very well be the natural climate "noise" from which we must discern our anthropogenic "signal" from. If we take a stroll between this interglacial and the last one back, the Eemian, we find in the Greenland ice cores that there were 24 Dansgaard-Oeschger oscillations (Figure 5, originally figure 1. Sole et al, 2007), or abrupt warmings that occurred from just a few years to mere decades that average between 8-10C rises (D-O 19 scored 16C). The nominal difference between earth's cold (glacial) and warm (interglacial) states being on the order of 20C. D-O events average 1470 years, the range being 1-4kyrs. "In this work ice-core CO2 time evolution in the period going from 20 to 60 kyr BP  has been qualitatively compared to our temperature cycles, according to the class they belong to.It can be observed in Fig. 6 that class A cycles are completely unrelated to changes in CO2 concentration. We have observed some correlation between B and C cycles and CO2 concentration, but of the opposite sign to the one expected: maxima in atmospheric CO2 concentration tend to correspond to the middle part or the end the cooling period. The role of CO2 in the oscillation phenomena seems to be more related to extend the duration of the cooling phase than to trigger warming. This could explain why cycles not coincident in time with maxima of CO2 (A cycles) rapidly decay back to the cold state. " "Nor CO2 concentration either the astronomical cycle change the way in which the warming phase takes place. The coincidence in this phase is strong among all the characterized cycles; also, we have been able to recognize the presence of a similar warming phase in the early stages of the transition from glacial to interglacial age. Our analysis of the warming phase seems to indicate a universal triggering mechanism, what has been related with the possible existence of stochastic resonance [1,13, 21]. It has also been argued that a possible cause for the repetitive sequence of D/O events could be found in the change in the thermohaline Atlantic circulation [2,8,22,25]. However, a cause for this regular arrangement of cycles, together with a justification on the abruptness of the warming phase, is still absent in the scientific literature." Figure 6. Sole et al (2007) D/O oscillation classes. In their work, at least 13 of the 24 D-O oscillations (indeed other workers suggest the same for them all), CO2 was not the agent provocateur of the warmings but served to ameliorate the relaxation back to the cold glacial state, something which might have import whenever we finally do reach the end Holocene. Instead of triggering the abrupt warmings it appears to function as somewhat of a climate "security blanket", if you will. Therefore in constructing the antithesis, and taking into consideration the precautionary principle, we are left to ponder if reducing CO2's concentration in the late Holocene atmosphere might actually be the wrong thing to do. The possibility consequently exists that at perhaps precisely the right moment near the end-Holocene, the latest iteration of the genus Homo unwittingly stumbled on the correct atmospheric GHG recipe to perhaps ease or delay the transition into the next glacial. Under the antithesis "Skeptics" and "Warmists" thus find themselves on the mutual, chaotic climate ground where the efficacy of CO2 as a GHG had better be right. "They knew they had the critical layer of ice in their snow cave [where the ice cores were first processed-wm]. Wanda Kapsner, a Penn State graduate student, had been taking thin sections about every 20 meters along the lengths of core laid out in the cave. She told Alley, 'This section is in Holocene ice and the next section 20 meters down is in Ice Age ice, and so between these two is where you're going to find it.'" "This team of scientists was about to complete their six-week stint at Summit, and a new team was about to take its place. So it was up to project leader and paleoclimatologist Paul Mayewski to decide which team was going to handle this important ice. On hearing the news from Kapsner, Mayewski told Alley, 'Fine, before we get out of here, we're going to do that ice.'" "The ice that had formed from falling snow during the transition from the last of the cold, dry, windy ice ages to the first of the warm, wet calms of the modern 10,000-year-long Holocene climate is 1,678 meters, just over a mile, down the GISP2 core. Rendered in ice, what exactly would it look like, this boundary of epochs? The young American scientists had read the literature from Chet Langway, Willi Dansgaard, Hans Oeschger, Wally Broecker, and others, and they had heard from the Europeans, who were about a year ahead of them in drilling at Summit. Yet still they were not entirely prepared for what they saw that day in the ice, for the suddenness of it." "'You did not need to be a trained ice core observer to see this,' recalled Alley. 'Ken Taylor is sitting there with the ECM and he's running along and his green line is going wee, wee, wee, wee - Boing! Weep! Woop! And then it stays down.' Dust in the windy ice age atmosphere lowered the acidity of the core to a completely new state. 'We're just standing there and he just draws a picture of it,"'Alley said." "Spontaneous celebration was followed by a sudden and unexpected quiet. 'I think we cheered,' recalled Alley, 'and then we were all a little sobered. Because it was just so spectacular. It was what we'd been looking for, and there it was, and then we're sitting there. Holy crap.'" "The instant of recognition that summer of 1992 had a raw feel to it, although eventually the disquiet would find concrete expression in numerous articles and presentations as the scientists became accustomed to the large truth of abrupt climate change and immersed themselves in its fine details. Alley recalled later: 'Those of us who were down there in that trench at that time knew right then that our picture of the world had changed. There's a whole bunch of us who came out of that ice core project who have since dedicated ourselves to understanding abrupt climate change.'" "In the GISP2 science trench, the tray holding the section of core rolled down the assembly line and then it was Alley's turn at the ice. "It slides across in front of me and I'm trying to identify years: 'That's a year, that's a year and that's a year, and - woops, that one's only half as thick.' And it's sitting there just looking at you. And there's a huge change in the appearance of the ice, it goes from being clear to being not clear, having a lot of dust." Paper after paper began to roll off the scientific presses from 1992 on, and just like the unfolding recognition of plate tectonics which preceded it by a few decades, it was literally riveting for all of us geologists fascinated by the Quaternary. So we get our first trap-speed: climate can switch abruptly from its cold to its warm state in just one year. Our first peg on the lower-end of natural noise. "Recent scientific evidence shows that major and widespread climate changes have occurred with startling speed. For example, roughly half the north Atlantic warming since the last ice age was achieved in only a decade, and it was accompanied by significant climatic changes across most of the globe. Similar events, including local warmings as large as 16°C, occurred repeatedly during the slide into and climb out of the last ice age. Human civilizations arose after those extreme, global ice-age climate jumps." "The new paradigm of an abruptly changing climatic system has been well established by research over the last decade, but this new thinking is little known and scarcely appreciated in the wider community of natural and social scientists and policy-makers. "("Abrupt Climate Change - Inevitable Surprises", Committee on Abrupt Climate Change, National Research Council of the National Academy of Sciences, 2002, ISBN: 0-309-51284-0, 244 pages, Richard B. Alley, chair). We will step a little closer in time and take a look at a rather fascinating ACC event. Proxy and isotopes become more difficult to work with over time, carbon 14 gets us back some 50kyrs, but no further. The longest and presumably best ice cores come from Greenland and so far extend no further than 135kyrs or so. So we will begin to examine some of the better resolved climate change trap-speeds from the Younger Dryas. "The ice was always melting back. Rivers were getting wider and flowing over new lands. Warm times were lasting longer. Forests were growing larger and richer, as were the big grasslands and their wild grains. Some 12,000 years ago, hunters were in the embrace of a stable, congenial climate stretching back farther than memory, perhaps farther than the stories told by the elders. For hundreds of years, the ice had been shrinking and a large swath of landscape had been bathing in steadily increasing warmth. In the fertile lands of West Asia, clans of an ancient people that would become known as the Natufians had long been accustomed to the good hunting of game and the easy gathering of fruits and wild grains. This was the way of the world for people 12,000 years ago. Nothing in the sky or the sea or on the land and nothing in memory warned them of what was to come. The change in climate was a surprise of life-bending power, as if the whole world turned against the clans. Cold, dry winds began sweeping the countryside, withering every living thing in their paths. First the fruits were lost and then the grasslands, and eventually the forests were driven back. The rivers shrank and some became choked with advancing ice. Without warning or recognition, in just a few years, a colder, harder, shorter, and more difficult way of life set in. From beginning to end, as far as the Natufians were concerned, the time of wind and cold lasted forever. Like the old time of warmth and plenty, the hard new climate stretched out beyond memory, holding humanity in its grip for something like 470,000 days. What in the world happened? Why did the climate over much of Earth so suddenly reverse itself? What is it about the way of the world that makes such a thing possible? Why did this crippling cold, windy, dry regime hold sway over the sparsely populated lands of the Northern Hemisphere for 13 centuries?" "Briefly, the data indicate that cooling into the Younger Dryas occurred in a few prominent decade(s)-long steps, whereas warming at the end of it occurred primarily in one especially large step (Figure 1.2) of about 8°C in about 10 years and was accompanied by a doubling of snow accumulation in 3 years; most of the accumulation-rate change occurred in 1 year. (This matches well the change in wind-driven upwelling in the Cariaco Basin, offshore Venezuela, which occurred in 10 years or less [Hughen et al., 1996].)" "Ice core evidence also shows that wind-blown materials were more abundant in the atmosphere over Greenland by a factor of 3 (sea-salt, submicrometer dust) to 7 (dust measuring several micrometers) in the Younger Dryas atmosphere than after the event (Alley et al., 1995b; Mayewski et al., 1997) (Figure 2.1). Taylor et al. (1997) found that most of the change in most indicators occurred in one step over about 5 years at the end of the Younger Dryas, although additional steps of similar length but much smaller magnitude preceded and followed the main step, spanning a total of about 50 years." The above quotes from page 27 of "Abrupt Climate Change - Inevitable Surprises" (referenced above). "In the case of the termination of the Younger Dryas cold event, for example 1/3 to 1/2 of the entire 10,000-year deglacial warming in Greenland was achieved in order of 10 years (Cuffey et al., 1995; Severinghaus et al., 1998), with most of the accumulation-rate change apparently in a single year (Alley et al., 1993). The scaling of 1/3 to 1/2 the deglacial change in about a decade probably applies in many places (Alley, 2000). Any event for which rate of change is anomalous by two to three orders of magnitude merits attention. Older events were even larger, with a rapid shift of about 16 C in Greenland in one case (Lang et al., 1999)." 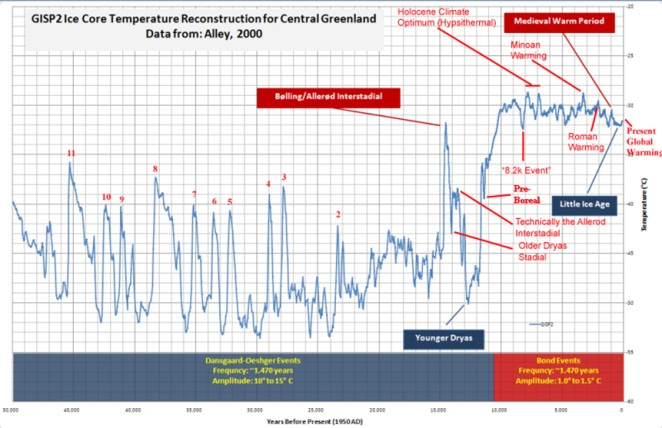 "The last two abrupt warmings at the onset of our present warm interglacial period, interrupted by the Younger Dryas cooling event, were investigated at high temporal resolution from the North Greenland Ice Core Project ice core. The deuterium excess, a proxy of Greenland precipitation moisture source, switched mode within 1 to 3 years over these transitions and initiated a more gradual change (over 50 years) of the Greenland air temperature, as recorded by stable water isotopes. The onsets of both abrupt Greenland warmings were slightly preceded by decreasing Greenland dust deposition, reflecting the wetting of Asian deserts. A northern shift of the Intertropical Convergence Zone could be the trigger of these abrupt shifts of Northern Hemisphere atmospheric circulation, resulting in changes of 2 to 4 kelvin in Greenland moisture source temperature from one year to the next." More recently the Akkadian Empire under Sargon (2,300-2,200 BC), mankind's first empire ever, succumbed to climate change that happened rather suddenly. A 300 year long period of drought struck this nascent civilization and toppled what turned out to be only a 100 year empire. The Old Kingdom of Egypt and the Harappans of the Indus Valley suffered a similar fate 4,200 years ago, succumbing to an abrupt drought that ended those civilizations, with Egyptians "forced to commit unheard of atrocities such as eating their own children and violating the sacred sanctity of their own dead (Fekri Hassan, 2001)". The Mayans had pretty much the same luck with three periods of extreme drought at 810, 860 and 910 AD. Sadly just two years after the last drought, which saw 95% of the Mayan population gone, wet years returned to the Yucatan. A reconstruction from fossil algae in sediments from Drought Lake in North Dakota of the past 2000 years found that dry conditions were far and away the rule in the High Plains, with the Dust Bowl conditions of the 1930's one of the lesser dry spikes found in the record. The Wisconsin glacial, which preceded the Holocene, the interglacial in which all of human civilization has occurred, is littered with ACC. D-O oscillations average 1,500 years, and have the same characteristic sawtooth temperature shape that the major ice-age/interglacials do, a sudden, dramatic, reliable, and seemingly unavoidable rise of between 8-10C on average, taking from only a few years to mere decades, then a shaky period of warmth (less than interglacial warmth), followed by a steep descent back into ice age conditions. Each D-O oscillation is slightly colder than the previous one through about seven oscillations; then there is an especially long, cold interval, followed by an especially large, abrupt warming up to 16C (a Bond cycle). During the latter parts of the especially cold intervals, armadas of icebergs are rafted across the North Atlantic (Heinrich events), their passage recorded reliably by the deep ocean sediment cores which capture the telltale signature of these events in dropstones and detritus melted out of them. "We have analysed the transition from the last ice age to our current warm interglacial period and there is such an abrupt change in climate that it is as if someone just pushed a button"
What should be fairly apparent is that in terms of sheer speed, major natural climate change can occur in the 1 year bracket, the bottom end of the natural noise range, and not just at the glacial terminations. We see evidence of many cycles, small and large, that occur from 3-7 years (El Nino range), on the decadal (AMDO/PDO) to millennial (D-O) scale. Not to mention the 100 million year major ice age cycles. Therefore, in order to qualify as a signal, and subsequently recognizable as anomalous, the signal must somehow exist outside of a range spanning 1-100,000,000 years. "Signal-to-noise ratio (often abbreviated SNR or S/N) is a measure used in science and engineering to quantify how much a signal has been corrupted by noise. It is defined as the ratio of signal power to the noise power corrupting the signal. A ratio higher than 1:1 indicates more signal than noise. While SNR is commonly quoted for electrical signals, it can be applied to any form of signal (such as isotope levels in an ice core or biochemical signaling between cells)." Think of SNR as possibly the simplest statistical test. This time we will work backwards from recent time (present to 70 million years ago [mya]). Mainly in terms of the two primary components of climate change, temperature and sea level. This part will be primarily visual, with the intent being to exercise your perhaps newfound skills in discerning signal relative to background. SRES marker series A1F1's upper error bar comes in at about 0.59 meters, about 2 feet, to 2099. To be prudent, we might round that up to 0.6 meters for the AGW "signal". I got this from the C3 website some time ago, but I do remember going to the source and digging up the data. Assuming the 75 year smoothed Law Dome 1,000 year record evinces the LIA and MWP, then the recent thousand-year noise is nominally say 1.5C, but also potentially inclusive of 3.1C. High SNR of about 0.4:1 (0.6/1.5), or 40% of the noise level, to low SNR of 0.2:1 (0.6/3.1), or 20% of the noise level. Not anomalous (need >1:1). Post "8.2k event" sea levels from Rio Grande do Norte, Brazil. Late Holocene sea level noise range of maybe 6 meters, -2 to +4 AMSL. A SNR of 0.1:1, or signal at 10% of the noise level. Not anomalous. Here we see the range perhaps -32.4 to -28.7, or a temperature noise envelope of 3.7C through the majority of the Holocene interglacial. The "8.2k event" and the Holocene Climate Optimum paired and evident. As is the rocky ride down since the Minoan Warming. SNR similar but lower still than the 1kyr comparison (0.16:1, 16% of the noise). Not anomalous. In the majority of the Holocene, the noise level is simply too high to accommodate recognition of the AR4 worst case AGW "signal" scenario. If we take what is widely recognized as the dual-thermal sea level maxima at MIS-5e (6 meters) then at the end-Holocene, the SNR degrades to just 10% of the latest post-MPT end-interglacial noise. Not anomalous. Beyond this point, SNR itself becomes subject to the larger post-MPT glacial/interglacial switch between the warm and cold states which have dominated climate for the past ~800kyrs or so. As we exit the Holocene (stage left), we have this interpretation of our present interglacial's sea level from "Holocene sea-level fluctuations inferred from the evolution of depositional environments of the southern Langebaan Lagoon salt marsh, South Africa, John S. Compton, "The Holocene 11,4" (2001) pp. 395 - 405 (sorry, best reference preserved in the downloaded paper I found online August, 2009). More sea level "noise", this one going back 200kya. The Eemian, the last interglacial, sea level history from the Red Sea (Rohling et al, 2008, Nature Geoscience, vol. 1, p. 39, January, 2008). Even on things which have happened, the science is not that particularly well-settled. A look at the Eemian (MIS-5e or 5.5) to termination T3 (prior to the MIS-7 interglacial) from Bard et al, 2002 (Earth and Planetary Science Letters 196, p. 135-146). The post-MPT from Jouzel et al, 2007 (www.sciencemag.org, Science, vol. 317). The past 5 million years. Again, I do not remember from what paper I extracted this. Note the gradual, post-PETM evolution of climate. Noise, at even more alarming levels is apparent not only in the primary decline, but in the range about the late mean. This takes us out to 70mya. Now that you have taken the "wild climate ride", which just predates the extinction of the dinosaurs to present, the Holocene trapping with a top SNR of just 0.4:1, ACC which traps in the one year bracket, and with respect to the definition of an anomaly, what would your present estimation be of the AR4 AGW worst-case "signal" prognostications? The entire non-debate on anthropogenic climate effects has always struck me "as two fleas arguing over who owns the dog they are riding on" (Crocodile Dundee). One of the required paradigms of AGW is patently ignoring "when we live" (ignorance of signal to noise ratio, or SNR). We live today possibly near the end of the most recent interglacial, the Holocene, or the 11,715 years since we melted our way out of the last glacial, the Wisconsin Ice Age, the interglacial in which all of human civilization has occurred. Five of the last six interglacials have each lasted about half a precession cycle. The precession cycle itself varies between 19,000 and 23,000 years and we are close to the 23kyr point now, making 11,715 years about half........which is why this discussion has relevance. So when will the Holocene end? But first a look at the often painful, difficult advance of Science. Who was Alfred Lohar Wegener? "He was the object of a kind of loathing that is only rarely seen in science. "It wasn't long before the established authorities closed ranks against Wegener's concept as if they were stamping out a plague. He never understood the depth of resistance to his thinking. Continental drift was received not merely as a mistaken idea but as an evil that jeopardized the credibility of geology as a science and the professional reputation of anyone who espoused it. Wegener was denied professorships at German universities, but eventually he found himself at the University of Graz in Austria. Ironically, though, in 1928, he was asked to lead a German expedition to Greenland." The expedition got underway in 1930. In November,1930, Ernst Sorge, of Wegener's Greenland meteorological expedition, discovered for the first time the records of paleoclimate preserved in the ice. "It would be some years before researchers would fully appreciate the value of Ernst Sorge's cold and lonely work in the winter of 1930 when he sawed and chipped and shoveled a shaft 54 feet down into the Greenland ice. Glaciologists at the time thought of the ice sheets almost exclusively as geological features whose movement across the landscape chronicled the slow waltz of a changing climate." Wegener died that winter of 1930. His Continental Drift theory of 1912 would not be proven until the 1960's, revolutionizing geology as the Theory of Plate Tectonics. It would be 30 years beyond that (the 1990s) before the scientific contributions of Ernst Sorge were fully recognized as another revolutionary concept: Abrupt Climate Change. Concern about abrupt climate change is especially inversely healthy today, as the Holocene is but the latest of the post Mid Pleistocene Transition (MPT) Extreme Interglacials, a thing almost nobody knows. An Extreme Interglacial can be variously described as a technical aspect of Ice Rafted Debris (IRD) in the ocean stratigraphic record, or more frequently as an interglacial that has achieved at least our sea level or our isotopic temps (<3.6 o/oo dO18). There is also a bit of controversy as to just which of the post MPT interglacials qualify. For the purposes of this essay we will define them as Marine Isotope Stages (MIS) 11, 5e (the Eemian) and 1 (the Holocene), with provisional inclusion of MIS-19, for reasons we will delve into. As one may glean from Figure 1, something seems to have happened to the 100kyr amplitude about 400kyrs ago, the climate ride got a tad wilder from then to present. The speculation is long and worth researching yourself, however it is not exactly the subject of this piece. As discussed in The Antithesis, we could very well be at the end of the most recent extreme interglacial. Although it is quite likely this thought will strike many as trivial, for some inexplicable reason it seems reasonable to wonder what the ends of the other extreme interglacials might have been like. If AGW/CAGW causes you qualms, queasiness or abject terror/irrational rage, then you would be wise to take the exit ramp here. Because there is, and has been, a long-running debate in the paleoclimatology literature that I suspect few of you have ever heard of, and it kicked off at the same time as the AGW hypothesis (or theory for post-normal scientists). © 1998 Elseveier Science Ltd.
© 1998 Elsevier Science Ltd.
"This is why the past million years has been essentially a continuing ice-age, broken occasionally by short-lived interglacials. It is also why those who have engaged in lurid talk over an enhanced greenhouse effect raising the Earth's temperature by a degree or two should be seen as both demented and dangerous. The problem for the present swollen human species is of a drift back into an ice-age, not away from an ice-age." "The Earth's current warm period that began about 11,000 years ago should give way to another ice age within about 1,500 years, according to accepted astronomical models. However, current levels of carbon dioxide are trapping too much heat in the atmosphere to allow the Earth to cool as it has in its prehistoric past in response to changes in Earth's orbital pattern." Which is more or less where Broecker was coming from in 1998 and where we ended up in "The Antithesis". A hypothesis that we might extend the present interglacial by the timely venting of a "climate security blanket", if you will. Also known as the Industrial Age. Just to recap a bit of that, Loutre and Berger (Loutre M. F. and Berger A.: Marine Isotope Stage 11 as an analogue for the present interglacial, Global Planet Change, 36, 209 - 217, 2003) predicted, from a computer model, that the current interglacial, the Holocene, might very well last another 50,000 years, particularly if CO2 were factored in. This would make the Holocene the longest lived interglacial since the onset of the Northern Hemisphere Glaciations some 2.8 million years ago (some say over the last 5MY). Of course, this was a model, for those enamored with models. It was soon put to rest by Lisiecki and Raymo (A Pliocene-Pleistocene stack of 57 globally distributed benthic D18O records, Paleoceanography, Vol. 20, PA1003, doi:10.1029/2004PA001071, 2005) which was quoted in "The Antithesis", and will be again later in this discussion. So this does indeed bear some serious scrutiny. We will begin with the Cenozoic and work our way to better and better resolutions. I again apologize for the presentation of some of these graphics. I whipped some of them together from professional papers for a slide show some years back, but, unfortunately, failed to take the time to properly reference them. There are a great many things to be pondered in Figure 2. Why have we been roughly cooling off since the PETM? Is the increase in climate variability about the mean since the dinosaurs to present indicative of (a) poorer proxies or less data with time? or (b) truly indicative of a gradually more variable climate? Would comparisons of climate at the PETM be valid for a post Panama Seaway closed world? And those are just a few. In Figure 3 we expand out the past 5 million years of climate change developed from those 57 deep ocean drilling program cores of Lisiecki and Raymo (2005). 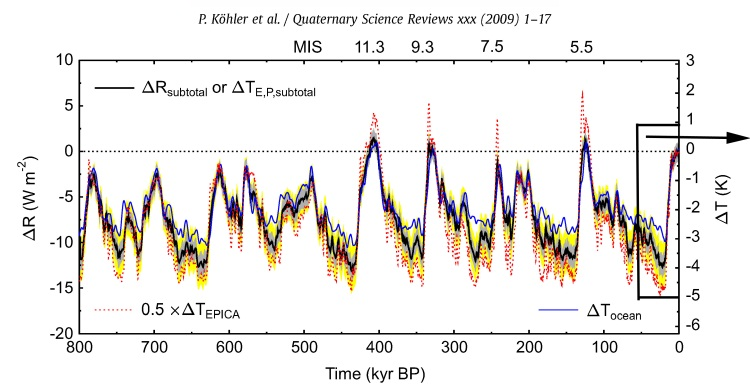 We see the beginning of the 41kyr obliquity paced million years of glacial/interglacial oscillation about 2.8mya and we see the initiation of the eccentricity paced 100kyr pairings at about 0.8-1mya. We see again the onset of the extreme interglaciations at about 400kyrs. In Figure 4, we zoom-in yet more on the post-MPT time beginning with MIS-19. In this depiction we see that MIS-19 did not appear to achieve temperatures of the true extreme interglacials, but it does have a lot more to offer. Orbitaly, it could be our closest interglacial analog in the climate record, although this is a matter of some debate in the literature. Which brings us to the point of this essay, what were the end extreme interglacials like? Although MIS-19 may not satisfy everyone as being an extreme interglacial, it did occur at an eccentricity minimum just like MIS-11 was and MIS-1 presently is. So in terms of trying to comprehend what might be the end extreme interglacial natural climate noise it has "standing". Figure 5. Multi-proxy view of post-MPT time. So what was the end of MIS-19 like? Well, MIS-19 appears to have had at least 3 abrupt warming events during glacial inception. Had the genus Homo gone all-civilized on us during MIS-19, we would all have had one heck of a time settling our AGW damage claims with our climate-change insurers, especially with the final one being of the highest dD amplitude. If any insurance types are here, I just gave you the proverbial "silver bullet" for rejecting AGW related climate damage claims. So collect your premiums with the appropriate conceit of a proper Wall Streeter, unless, of course, you also issue coverage for natural climate changes or "Acts of God". K. Pol et al. (2010) also attempt various astronomic and MIS-1 fittings to see how ours "stacks up" (Figure 6). Could we also be in range of such events? Which brings us to MIS-11, the Holsteinian interglacial. Remember I said that 5 of the last 6 interglacials all lasted about half of a precessional cycle? Well that 6th one was MIS-11. MIS-11 has long been shown to consist of at least two insolation peaks, a fairly sharp one soon after glacial termination, and a long, fairly broad one after an interval of cooling. But if you take the time to closely inspect all of the figures presented here, you will likely note that they are not all the same everywhere and in every study. It's called science. The estimated length of MIS-11 seems to vary from 20-33kyrs, depending upon which study you are reading. "Recent research has focused on MIS 11 as a possible analog for the present interglacial [e.g., Loutre and Berger, 2003; EPICA community members, 2004] because both occur during times of low eccentricity. The LR04 age model establishes that MIS 11 spans two precession cycles, with 18O values below 3.6o/oo for 20 kyr, from 398-418 ka. In comparison, stages 9 and 5 remained below 3.6o/oo for 13 and 12 kyr, respectively, and the Holocene interglacial has lasted 11 kyr so far. In the LR04 age model, the average LSR of 29 sites is the same from 398-418 ka as from 250-650 ka; consequently, stage 11 is unlikely to be artificially stretched. However, the June 21 insolation minimum at 65N during MIS 11 is only 489 W/m2, much less pronounced than the present minimum of 474 W/m2. In addition, current insolation values are not predicted to return to the high values of late MIS 11 for another 65 kyr. We propose that this effectivelyprecludes a 'double precession-cycle' interglacial [e.g., Raymo, 1997] in the Holocene without human influence." "While the astronomical analogy between MIS 1 and MIS11 has been incorporated in mainstream literature, there is a distinct difference between the two intervals: the Holocene contains one insolation peak so far, while the MIS 11 interval of full interglacial conditions (Substage 11c of the marine isotopic stratigraphy) extends over two insolation peaks. Thus an interesting situation has arisen with regard to the precise alignment of the two intervals." "... the precessional alignment would suggest that the Holocene is nearing its end, "while the obliquity alignment would suggest it has another 12,000 years to run its course. "In this view, the two Terminations are incommensurate and MIS-1 is analogous only to the second part of MIS-11c." Figure 10. MIS-11 from Lake Baikal sediments. Multiple views of MIS-11 clearly indicate a Twin-Peak configuration, though, as one might well expect, varies from one place to the next. K, Pol et al (2011) and Tzedakis (2010) both tend to show an elongated and higher amplitude late peak for MIS-11a whereas Voelker et al (2009) and Prokopenko et al (Clim. Past, 6, 31 - 48, 2010, ) show a broader, more symmetrical pair of peaks. As we leave the double insolation-peak MIS-11, with it's possible +21.3m amsl highstand and 20-33kyr length, I am again struck by the magnitude of both the natural noise and the difficulty one will have winning an argument with a clued-in climate change insurer over a whopping IPCC AR4 worst case +0.59m amsl fizzle, with or without it's consensus accolades. Which brings us to the most recent interglacial, the Eemian, or MIS-5e. As it occurred midway between the last eccentricity maximum and our present minimum it is not considered to be a good orbital analog. However it seems to have also been quite the extreme little interglacial. I will again be using some citations quoted in "The Antithesis" to "insure" against the risk that some of the "insured" won't get it. "The geology of the Last Interglaciation (sensu stricto, marine isotope substage MIS 5e) in the Bahamas records the nature of sea level and climate change. After a period of quasi-stability for most of the interglaciation, during which reefs grew to +2.5 m, sea level rose rapidly at the end of the period, incising notches in older limestone. After brief stillstands at +6 and perhaps +8.5 m, sea level fell with apparent speed to the MIS 5d lowstand and much cooler climatic conditions. It was during this regression from the MIS 5e highstand that the North Atlantic suffered an oceanographic ''reorganization'' about 11873 ka ago. During this same interval, massive dune-building greatly enlarged the Bahama Islands. Giant waves reshaped exposed lowlands into chevron-shaped beach ridges, ran up on older coastal ridges, and also broke off and threw megaboulders onto and over 20 m-high cliffs. The oolitic rocks recording these features yield concordant whole-rock amino acid ratios across the archipelago. Whether or not the Last Interglaciation serves as an appropriate analog for our ''greenhouse'' world, it nonetheless reveals the intricate details of climatic transitions between warm interglaciations and near glacial conditions." Savvy insurers take note to make appropriate use of the "Acts of God" clauses. In Figures 10-13, we see the End Eemian in quite remarkable detail. This is predominantly due to its relatively young age compared to any other interglacial. One needs but to consider the effects of the average 400 foot sea level swings in and out of each of them, some going higher than others, to grasp how each of them tend to erase the evidence from the others. For instance, paleoclimatologists that are adept at deep sea diving might be able to uncover evidences of say MIS-7 and MIS-9 sea level highstands because they are presently below sea level. I wouldn't take out to much insurance on that though. And look at the range of estimates, +6m to +45m amsl, and often detecting the highstands at the very end of the Eemian. "Investigating the processes that led to the end of the last interglacial period is relevant for understanding how our ongoing interglacial will end, which has been a matter of much debate....."
"The onset of the LEAP occurred within less than two decades, demonstrating the existence of a sharp threshold, which must be near 416 Wm2, which is the 65oN July insolation for 118 kyr BP (ref. 9). This value is only slightly below today's value of 428 Wm2. Insolation will remain at this level slightly above the inception for the next 4,000 years before it then increases again." Now that is some bombshell! We may only have about the next 4,000 years, a little less than half the time since we "Homos" learned how to write, where climate sensitivity will be alarmingly close to glacial inception. "The Antithesis" provides documentation of CO2 effects during the latter half of the last glacial, so I will refer you to that essay for the succulent details. Suffice it to say that what this may boil down to is strip the appropriate amount of "climate security blanket" out of the late Holocene atmosphere as fast as is humanly possible (perhaps tipping us into the next ice age), or keep a decently healthy dose of it up there for at least the next 4,000 years. So we now have quite the conundrum. Will we do a typical eccentricity minima sea-level "Cha-Cha" at our very end? It would appear to be the norm, and may not be restricted just to eccentricity minima end extreme interglacials given the "competition" from MIS-5e, which occurred neither at an eccentricity minima or maxima. And they do appear to be rather extreme, don't they? So do not be too shy about investing in savvy climate change policy writing insurers. If they read this, they will probably never have to pay out a claim. Pay attention Big Oil etc., you could have a field day on Kivalina and other Public Trust Doctrine style litigation just by "stocking-up" on what has "gone down" climate-wise, without even having to be exposed to the heathen devil gas itself. Anthropogenic Global Warming/Catastrophic AGW. World will continue to warm, perhaps catastrophically, as a result of GHG emissions. IPCC AR4 worst case estimate for sea level by 2100 is +0.59 meters amsl. End Eemian achieved, at least, 10 times this (if we use +6 meters amsl), almost an order of magnitude more if we use the +45m estimate. End Holsteinian achieved 36 times this predicted excursion (using 21.3 meters amsl), covering the low and high ends of natural, end extreme interglacial, climate noise. The Signal to Noise Ratio (SNR) range for AGW predictions to 2100 come in at a range of 0.1 to 0.03 compared to "normal" end extreme interglacial climate noise. Worst case projections are therefore woefully not anomalous (at best 10% of natural noise), with the projected AGW/CAGW signal scoring a measly 3-10% of normal end extreme interglacial climate noise levels. Such a signal will be difficult to distinguish. Holocene Interglacial (Loutre and Berger, 2003) will "go-long" (perhaps another 50,000 years), outlasting every previous interglacial in the past 5 million years. Holocene is a tad over half-a precession cycle old now. If a precession match, it might be "winding-up" to "wind-down", like all previous end extreme interglacials. The possibility consequently exists that at perhaps precisely the right moment near the end-Holocene, the latest iteration of the genus Homo unwittingly stumbled on the correct atmospheric GHG recipe to perhaps ease or delay the transition into the next glacial. "The onset of the LEAP occurred within less than two decades, demonstrating the existence of a sharp threshold, which must be near 416 Wm2, which is the 65oN July insolation for 118 kyr BP (ref. 9). This value is only slightly below today's value of 428 Wm2. Insolation will remain at this level slightly above the glacial inception for the next 4,000 years before it then increases again." Apologies for quoting Sirocko et al (2005) twice in rapid succession. In the final analysis, the only question that remains unanswered, with respect to climate change, is would "a caveman get this?" "The possible explanation as to why we are still in an interglacial relates to the early anthropogenic hypothesis of Ruddiman (2003, 2005). According to that hypothesis, the anomalous increase of CO2 and CH4 concentrations in the atmosphere as observed in mid- to late Holocene ice-cores results from anthropogenic deforestation and rice irrigation, which started in the early Neolithic at 8000 and 5000 yr BP, respectively. 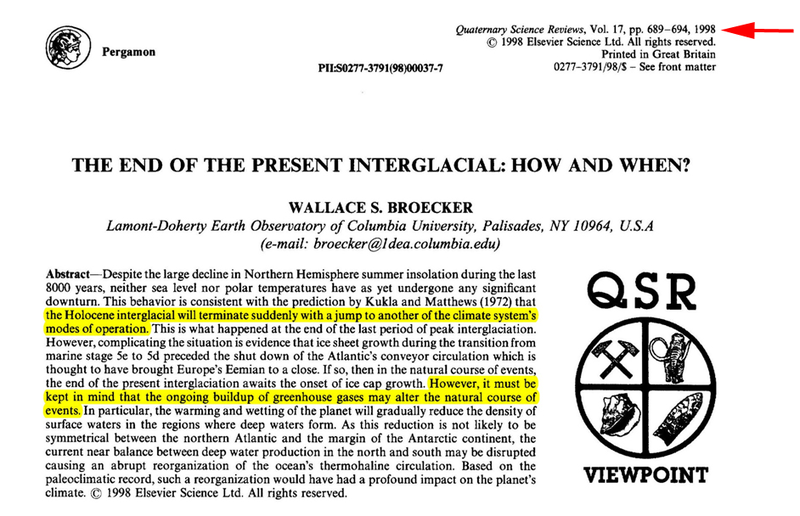 Ruddiman proposes that these early human greenhouse gas emissions prevented the inception of an overdue glacial that otherwise would have already started." The climate history of the present interglacial is in many ways comparable with MIS 5.5, and the present conditions in Northern Europe do in some ways fulfill requirements for glacial inception. Even at its present minimum position the Northern Hemisphere summer insolation is, however, fundamentally different from the situation 115,000 yr ago. The insolation fall during the Holocene has been less than half of the fall during MIS 5.5. The present value is also 40 W/m2 higher than the values at 115,000 yr. Together with the high levels of greenhouse gases, this difference in insolation forcing is probably the main factor preventing glacial inception today. A. Strip said "climate security blanket" from the late Holocene atmosphere, and be quick about it. We have denied gaia her next ice age for far too long already. B. Be thankful we stumbled onto this interglacial climate-maintenance cocktail when we did. The last time gaia was at a ~400kyr eccentricity minimum was during MIS-11 (the Holsteinian interglacial of some authors). MIS-11 went long, lasting somewhere between 1.5 - 2 full precession cycles. MIS-19, two ~400 kyr eccentricity minima (~800 kyrs) back to the initiation of the eccentricity-paced ice age/interglacial couples of the post-MPT stage of the Pleistocene, lasted about half a precession cycle, as has the Holocene so far, and every post-MPT interglacial save MIS-11 has. We are either going to have another "extended interglacial", like MIS-11 did, or we won't, like MIS-19 didn't, given that like them we are once again at a 400kyr eccentricity minimum. If the Holocene is to "go-long" like MIS-11 did, what could we possibly deploy to get us through the several thousand years of cold between the first and second MIS-11 insolation peaks (given we are at an insolation minimum now and were then)? MIS-11 from Lake Baikal sediments. · If the Holocene is not supposed to "go-long", is there something we could deploy to delay or obviate the next glacial inception? Like perhaps CO2/CH4/GHGs etc. et al? To CO2, or not to CO2? "The onset of the LEAP occurred within less than two decades, demonstrating the existence of a sharp threshold, which must be near 416 Wm2, which is the 65oN July insolation for 118 kyr BP (ref. 9). This value is only slightly below today's value of 428 Wm2. Insolation will remain at this level slightly above the [glacial] inception for the next 4,000 years before it then increases again." Which I will restate as follows: "Can anyone think of something, anything, anything at all, that we might possibly do to span just the next 4,000 years? You know, before insolation increases again?" If not GHGs, then what, precisely? "The lesson from the last interglacial "greenhouse" in the Bahamas is that the closing of that interval brought sea-level changes that were rapid and extreme. This has prompted the remark that between the greenhouse and the icehouse lies a climatic "madhouse"! Whereas no certified criteria have been put forth (so far) as regard glacial inceptions. What is known about the ends of the post-MPT interglacials MIS-19, MIS-11 and MIS-5e serve as our primary guides as to what climate might reasonably be anticipated to attend the next post-MPT glacial inception. At least 3 problems would seem to persist. MIS-19: This discussion extends the discussion presented in as related to MIS-19 which occurred somewhere within or at the Mid Pleistocene Transition, a climate evolution period between the obliquity-paced world (41 kyr glacial/interglacial cycles) to the eccentricity-paced (~100kyr glacial/interglacial cycles) world we have evolved through to the present. MIS-19 is the 8th interglacial back in the record, with MIS-1, the Holocene, being the 9th one since the MPT. Whereas MIS-19 may not satisfy everyone as an interglacial belonging to the present eccentricity-paced major climate cycles, it also occurred at a 400kyr eccentricity minimum cycle, just like MIS-11 (the Holsteinian) did and MIS-1 (the Holocene) is doing now. "During the glacial inception from MIS 19 to MIS 18, the low resolution EPICA Dome C water stable isotope record (Jouzel et al., 2007) has revealed millennial variability principally marked by the occurrence of three consecutive warm events (hereafter called Antarctic Isotope Maxima - AIM, following EPICA-community-members, 2006, and noted A, B, C on Fig. 2)." Please note the amplitude gain at AIM-A, from the decaying interglacial baseline, exceeds that of AIM-B and C which preceded it. We have but to look at the post Holocene Climate Optimum warm spells, i.e. the MWP, Roman and Minoan (to name a few of the already named few), to see that they also peaked above the most recent grand solar maximum (may it rest in peace). How many thermal excursions will the end-Holocene have? How many has it already had? Perhaps more importantly, how will we tell? Seven of the last eight post-MPT interglacials have each lasted about half a precession cycle. The precession cycle itself varies between 19 and 23kyrs and we are at the 23kyr part of that cycle now, making 11,500 half. As of 2014 the Holocene is exactly 11,717 years old (based on the end of the Younger Dryas cold interval). Or pretty much about half a precession cycle. Do Rohling et al (2010) sum it up for us? This draws attention to MIS-19 (~780 ka), for which greenhouse gas concentrations can still be derived from Antarctic ice cores (Loulergue et al., 2008), although sea-level data similar to that used here for MIS-11 and the Holocene would require new, deep (Integrated Ocean Drilling Project) drilling in the central Red Sea. Recent comparisons of CO2 and CH4 trends through MIS-19 with those of the Holocene, in the absence of sea-level constraints, have been used to suggest that the Holocene should have terminated already (Kutzbach et al., 2009), although opinions remain divided (Tzedakis, 2009)." But the thing is that 3rd and final end MIS-19 thermal excursion was the strongest. "The Marine Isotope Stage 11 interglacial, centered at ~400 ka, appears to be the best candidate for understanding climatic changes in the context of low insolation forcing such as that of our present interglacial. Direct correlation between terrestrial (pollen) and marine climatic indicators and ice volume proxy from deep-sea core MD01-2447 (off northwestern Iberia) shows for the first time the phase relationship between southwestern European vegetation, sea surface temperatures in the northeastern Atlantic midlatitudes and ice volume during MIS 11. A warmest 32,000 years-long period and three following warm/cold cycles occurred synchronously on land and ocean. The end of the warmest period sees the glacial inception which coincides with the replacement of warm deciduous forest by conifer (pine-fir) expansion in northwestern Iberia and, consequently, with the southward migration of the tree line in high latitudes in response to declining summer insolation. As weak insolation changes alone cannot account for ice growth, the associated vegetation changes must now be considered as a potential major feedback mechanism for glaciation initiation during MIS 11." "Marine Isotope Stage (MIS) 11, the interglacial dated at c. 400 ka, is marked by Earth's orbital geometry being very similar to that of MIS 1 (~14 ka-present) (Loutre and Berger, 2003) and, therefore, appears to be the best candidate to predict the natural evolution of the present interglacial. The climate behavior simulated by the LLN-2D model for MIS 11 and MIS 1 shows an unusually 50,000 years long period of warmth and minimum northern hemisphere continental ice volume (Loutre and Berger, 2003). The new EPICA-DOME C record suggests that temperature remains warm for 28,000 years during MIS11 (EPICA community members, 2004). Marine data from MIS 11 have led to the traditional idea of an exceptional interglacial in the oceanic realm, the longest and warmest of the last 500 ka (Droxler and Farrell, 2000; Howard, 1997). This is challenged by several authors who claim that this interglacial was not substantially warmer than today (e.g. Bauch et al., 2000; Hodell et al., 2000). A recent review of the putative continental records of MIS 11 suggests that this interval was moister than present and temperature estimates varied from similar to the present, to warmer from place to place (Rousseau, 1999)." "Earth's particular orbital configuration during MIS-11 implies an astronomical climatic forcing greatly different than succeeding interglacial stages such as MIS 5. This different orbital forcing is traduced by a relatively weak northern summer insolation and low amplitude variations during MIS 11, contrasting with the large insolation changes and associated high maxima during MIS 5. This raises the question of the ''Stage 11 Paradox'': astronomical forcing during stage 11 is too low by itself to drive climate into interglacial conditions (Li et al., 1998) and yet the 12-11 Termination appears to be the largest of the last million years (Imbrie and Imbrie, 1980). Moreover, insolation changes cannot alone trigger the glacial initiation during MIS 11 as the summer insolation decrease is modest. New evidence from the first land - sea direct correlation of MIS 11 demonstrates the synchroneity between marine and terrestrial responses to the climate variability of MIS 11. Reassessment of continental and marine sequences from North Atlantic, Europe, Siberia as well as Antarctica reveals a similar pattern of climatic variability over MIS 11 marked by a long and warm first period followed by three warm/cold cycles. We have also demonstrated that the Holsteinian interglacial is the warmest period of MIS 11 in northern Germany. Isotopic data show that ice actually accumulated in northern high latitudes as soon as 400 ka. Further, pollen data indicate a southward migration of vegetation belts involving albedo increase and glacial inception as early as 405 ka. This ice growth is associated with a general oceanic and atmospheric cooling till 390 ka. Geological records and MoBidiC experiments contradict the 50 ka long ice-free interval simulated by the LLN-2D model which is only forced by CO2 and insolation. Models for predicting the future of our present interglacial, characterized as MIS 11 by weak insolation changes, should not underestimate the effect of declining insolation on vegetation and the associated feedback mechanisms that help foster glaciation." We find ourselves something like ~6 - ~9kyrs past the "Holocene Climate Optimum." I do not think anyone really knows how many bouts of climatic "madhouse" the end Holocene is supposed to experience, or whether or not we can detect, for the first time ever, an as yet unseen future anthropogenic climate "signal" beyond its diminutive ramp-up amplitude. Are there any credible (latitude is assumed here) estimates for how long the anthropocene will last or if it might last say longer than say ~600 years? Especially amidst up to three thermal excursions which range from 1 to almost 2 orders of magnitude larger than AGW climatic "madhouse" peaks. Note the annotation I added to point-out SRES marker series A1F1's upper error bar which comes in at about +0.59 meters, about 2 feet, to 2099. The A1F1 SRES marker series is IPCC's worst case scenario, or "business as usual" if we continue to do nothing about GHG etc. emissions. How on earth (literally) are we going to detect, reliably or not, a "first-ever" anthropogenic climate "signal", at the latest half-precession cycle old extreme interglacial, when our very best (or worst) anthropogenic future "signal" is just over an order of magnitude less than the lowest estimate of the second strong thermal pulse and sea level highstand achieved naturally at the end of the most recent interglacial? But things just might be worse than you think. If we compare apples to apples (upper error bar A1F1 of +0.59 m to the highest estimate I have seen for the end-Eemian of +52.0 m) then the end extreme interglacial "noise" grows to almost 2 orders of magnitude greater than the first-ever future maximum anthropogenic "signal" which has yet to stand-up and be recognized. Signal processing and pattern recognition theory should inform us that detecting a signal we can't yet describe (because CAGW is in the future, we only "model" what that might look like) from a stochastic "noise" background between 1 to almost 2 orders of magnitude greater than the "signal" is a logical absurdity. It is even more absurd if/when we have to pick which possible (of maybe 2 or 3) end-Holocene thermal excursion is supposed to be "ours", given that the last 2 times we have been at an eccentricity minimum there were 3 dramatically stronger natural thermal excursions right at the ends of both MIS-19 and MIS-11. To date I have not seen an educated guess, other than one anthropogenic, as to how many thermal excursions the end Holocene might reasonably be expected to host. However the real and present danger, the 800 pound gorilla(s) in the climate change room, the ones never talked about at Conference(s) of the Parties, is the climatic "madhouse", a.k.a. the end-Holocene glacial inception, which we may still be avoiding because of our now many wayward Holocene civilizations. One wonders if "Even a caveman would get this!" Keeping in mind, of course, that we have indeed been through glacial inception at least once (if not twice) before, as our stone-age H. sapiens selves. Way back then we couldn't write and re-write laws, much less the laws of science, "cloudy" computer code et al, simply because apparently we could not yet write until ~10,000 or so years ago. Writing appears to be wholly a Holocene invention. We are going to get very deep into the peer-reviewed literature on this. But there is one item that needs to be dealt with first. Without fail there will be those firmly anchored in 2003 (such as the IPCC et al etc.) when a landmark paper by Loutre and Berger ( paywalled) suggested that the Holocene has another 50,000 years to run. This is based on an intermediate complexity model (LLN 2-D NH) developed at Louvain-la-Neuve. For those enamored with models. "Recent research has focused on MIS 11 as a possible analog for the present interglacial [e.g., Loutre and Berger, 2003; EPICA community members, 2004] because both occur during times of low eccentricity. The LR04 age model establishes that MIS 11 spans two precession cycles, with 18O values below 3.6 o/oo for 20 kyr, from 398-418 ka. In comparison, stages 9 and 5 remained below 3.6 o/oo for 13 and 12 kyr, respectively, and the Holocene interglacial has lasted 11 kyr so far. In the LR04 age model, the average LSR of 29 sites is the same from 398-418 ka as from 250-650 ka; consequently, stage 11 is unlikely to be artificially stretched. However, the June 21 insolation minimum at 65N during MIS 11 is only 489 W/m2, much less pronounced than the present minimum of 474 W/m2. In addition, current insolation values are not predicted to return to the high values of late MIS 11 for another 65 kyr. We propose that this effectively precludes a 'double precession-cycle' interglacial [e.g., Raymo, 1997] in the Holocene without human influence." If you have not moved-on from Loutre and Berger's 2003 hypothesis yet, you will find a wealth of material here with which you may do so now. "Listen, and understand. That [interglacial] terminator is out there. It can't be bargained with. It can't be reasoned with. It doesn't feel pity, or remorse, or fear. And it absolutely will not stop, ever......" Kyle Reese in "The Terminator"
In perhaps the single most stunning Logical Absurdity of all time, we may have proved Kyle Reese wrong. If the IPCC/AGW/CAGW (a.k.a. warmists) are correct about GHGs etc., the reason we are not already several thousands of years into the next glacial might be because of GHGs.... We may have terminated the interglacial terminator, stopping it cold in its tracks, before things went all cold (glacial, a.k.a. ice age) on us once again. The "Early Anthropogenic Hypothesis" and the "Sledgehammer Argument"
"We will illustrate our case with reference to a debate currently taking place in the circle of Quaternary climate scientists. The climate history of the past few million years is characterised by repeated transitions between 'cold' (glacial) and 'warm' (interglacial) climates. The first modern men were hunting mammoth during the last glacial era. This era culminated around 20,000 years ago  and then declined rapidly. By 9,000 years ago climate was close to the modern one. The current interglacial, called the Holocene, should now be coming to an end, when compared to previous interglacials, yet clearly it is not. The debate is about when to expect the next glacial inception, setting aside human activities, which may well have perturbed natural cycles. "On one side, Professor Bill Ruddiman carefully inspected and compared palaeoenvironmental information about the different interglacial periods. 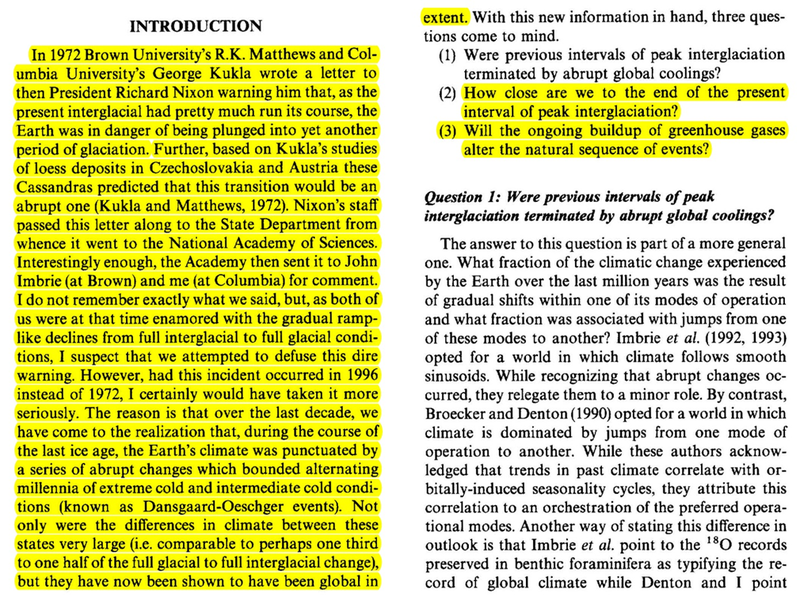 This comparison let him to conclude that glacial inception is largely overdue [4, 5]. According to him, the Holocene was not supposed to be this long, but the natural glacial inception process was stopped by an anthropogenic perturbation that began as early as 8,000 years ago (rice plantations and land management by antique civilisations). On the other side, Professor Andre Berger and colleagues developed a mathematical model of the climate system, rated today as a 'model of intermediate complexity' [6, 7] to solve the dynamics of the atmosphere and ice sheets on a spatial grid of 19 x 5 elements, with a reasonably extensive treatment of the shortwave and longwave radiative transfers in the atmosphere. Simulations with this model led Berger and Loutre to conclude that glacial inception is not due for another 50,000 years, as long as the CO2 atmospheric concentration stays above 220 ppmv . Who is right?" ask Crucifix and Rougier (2009). "Ruddiman (2003) introduced a three-part hypothesis on early anthropogenic influences on late Holocene climate. He proposed that humans reversed a natural decrease in atmospheric CO2 values 8000 years ago by starting to clear forests for farms, that they reversed a natural methane decrease after 5000 years ago mainly by beginning to irrigate rice, and that they caused an anthropogenic warming sufficient to counter most of a natural cooling and avoided the onset of a new glaciation within the last several thousand years. Critics have correctly noted that stage 11 is a better insolation analog for the Holocene because of its comparably low eccentricity values. "I recently examined (Ruddiman, in press) the part of stage 11 regarded as the closest insolation analog to the last several millennia of the Holocene and the next few millennia (Berger and Loutre, 2003). This interval occurred in the millennia between 400,000 years ago and ∼390,000 years ago. "During this analog to modern conditions, atmospheric methane concentrations fell to just under 450 ppm and CO2 values to 250 ppm (Figure 1a and b). In both cases, the levels reached were very near to the natural Holocene levels predicted in the early anthropogenic hypothesis. As stage 11 was an entirely natural (nonanthropogenic) world in which the insolation forcing was similar to the Holocene, these observations provide strong support for the hypothesis. "Several lines of evidence indicate that a glaciation was underway during the part of stage 11 when insolation values were most analogous to the present. Icebergs began carrying abundant debris to Nordic Sea sediments just after 400,000 years ago, following a long interval with negligible deposition (Bauch et al., 2000). For ice rafting to have occurred in that region, new ice must have begun growing either in Scandinavia, the Barents Sea, or along the coasts of Greenland. "Claussen et al. cite the EPICA interpretation that the current interglaciation must still have many millennia left to run if it is to persist as long as the one in stage 11. But the EPICA interpretation contains what I regard as a fatal flaw. EPICA aligns the beginning of the two interglaciations and compares their subsequent duration (Figure 2A), but this choice results in a total misalignment of the 65◦N summer insolation trends in the two interglaciations (Figure 2b). The correct alignment of the insolation trends (used by Berger and Loutre, 2003) matches the modern-day insolation minimum with a similar minimum 397,000 years ago (Figure 2D). This alignment of stage 1 with the end (rather than the beginning) of stage 11 leads to the conclusion that the Holocene interglacial warmth should have already ended (Figure 2C). "The proposed sequence during the Holocene is as follows. Direct carbon emissions from anthropogenic (mostly agricultural) sources accounted for most of the Holocene methane anomaly and a smaller fraction (perhaps a third) of the CO2 anomaly. These direct emissions caused a climatic warming sufficient in size to cancel the appearance of small northern hemisphere ice sheets and to suppress the size of major advances of southern hemisphere sea-ice. The failure of these natural changes to develop then contributed to the remaining (and larger) part of the CO2 anomaly as a form of positive feedback to the initial 'direct' anthropogenic impacts. "Most critics of my hypothesis have neglected to respond to the single most powerful argument in its favor. In a notable exception, Crucufix et al. termed this the "sledgehammer argument". During previous interglaciations (stages 5, 7, 9, and now also 11), when nature was in full control of climate, and when insolation trends were headed in the same direction as they are now, concentrations of CO2 and CH4 fell in every instance. Alone among the last five interglaciations, stage 1 shows a substantial greenhouse-gas rise. My challenge to the critics is this: Why did CO2 and CH4 concentrations rise in the middle and late Holocene, when they had previously always fallen? The seemingly unavoidable implication is that something about stage 1 is different - not "natural". The most plausible answer is the onset of agriculture. "The same argument works in the converse sense: any argument devised to explain the stage 1 greenhouse-gas increase as "natural" in origin has already dug itself a very deep hole. For example, Joos et al. (2004) call on terrestrial vegetation, ocean carbonate, and coral reefs as natural sources of carbon to explain the Holocene CO2 rise. Given our still-uncertain knowledge of carbon dynamics (Crucufix et al. ), these alternative explanations for the late-Holocene CO2 rise can be proposed, and model simulations can be run that match a portion of the carbon-budget demands. But how will these explanations fare when tested in the past? "Tested against the reality of the last four interglaciations, any such explanation must fail. All of the major climatic boundary conditions during the previous interglaciations were similar to those found today: the major ice sheets had melted, sea level was high, boreal vegetation was in an interglacial state, tropical monsoon vegetation was in retreat, and insolation trends were similar (especially during stage 11). Given this pervasive similarity in the major sources of forcing, the explanations must predict (and the models must presumably simulate) similar rises in CO2 during the earlier interglaciations. In fact, for those interglaciations with stronger insolation forcing than the Holocene, the predicted CO2 increases would probably be even larger than the Holocene rise. "But the CO2 and CH4 concentrations did not rise during the intervals most similar to today; they fell. It seems inevitable that these naturally based explanations must fail the test on all four previous interglaciations. Indeed, the large increases in gas concentrations these explanations should predict will make it all the more difficult to explain the large decreases actually observed." Finally, the alignment shown in Fig. 4 (which is similar to that of Ruddiman, 2005, 2007) exemplifies a completely different, more controversial (Spanhi et al., 2005; Siegenthaler et al., 2005), possibility. It has been argued that variability in the planetary energy balance during Pleistocene glacial cycles was dominated by greenhouse gas and albedo related feedback mechanisms, and that the role of insolation was limited to only triggering the feedback responses (Hansen et al., 2008). Hence, the apparently anomalous climate trends of the most recent 2.0-2.5 millennia should also be investigated in terms of changes in these feedback responses due to processes other than insolation, including controversial suggestions concerning man's long-term impacts from deforestation and CH4 and CO2 emissions (Ruddiman, 2003, 2005, 2006, 2007; Hansen et al., 2008). There is support from modelling studies that the relatively minor early anthropogenic influences may have been sufficient to delay glacial inception (Vavrus et al., 2008; Kutzbach et al., 2009). Chappell (1974) estimated paleo-sea levels for emergent MIS 7 reefs on the rapidly rising coast of New Guinea. His calculations indicate that at least two MIS 7 sea levels were very close to present (see his Fig. 19). Finally, there are a few emergent MIS 7 marine deposits on tectonically stable or very slowly uplifting coasts or islands. On tectonically stable Bermuda, Harmon et al. (1983) report ages of ~220 ka to ~200 ka for corals from the Belmont Formation, a marine deposit that occurs at elevations of 1 m - 2 m above sea level. Our data from the Florida Keys, while not tightly constrained by age, indicate that sea level during MIS 7, probably ~200 ka, was close to present or perhaps a couple of meters higher. In this regard, our interpretations are in agreement with some estimates of high MIS 7 sea level from Barbados (Gallup et al., 1994; Thompson and Goldstein, 2005), at least one estimate from New Guinea (Chappell, 1974), and southern Australia (Murray-Wallace, 2002). Other studies, from coastlines with both high and low uplift rates, indicate sea level during MIS 7was significantly lower than present. Unfortunately, many MIS 7 coastal records, ours included, do not have ideal geochronology and firm conclusions about sea-level history during this interglacial must await further study. If the global model and the estimated paleo-sea levels for south Florida are correct, then it is apparent that a significant portion of the Greenland ice sheet and possibly all of the West Antarctic ice sheet were lost during the Last Interglacial period. So what is the wise wise one (Homo sapiens sapiens) to do? If the efficiency (sensitivity) of CO2/GHGs as a "climate security blanket" is as high as we have been advised by the IPCC et al etc., and may have already delayed glacial inception for thousands of years, then why would anyone want to remove such a "climate sledgehammer/security blanket" from the normal, natural path of possibly millennia "overdue" glacial inception? Did some ~97% of "us" just bump "our" heads? "Rapid changes in sea level and associated destabilization of climate at the turbulent close of the last interglacial maximum appear to be recorded directly in the geomorphology, stratigraphy, and sedimentary structures of carbonate platform islands in the Bahamas. Considered together, the observations presented here suggest a rapid rise, short crest, and rapid fall of sea level at the close of 5e. "Sea level was 6-7 m higher than present during the last interglacial highstand 125,000-115,000 years before present (MIS 5e). 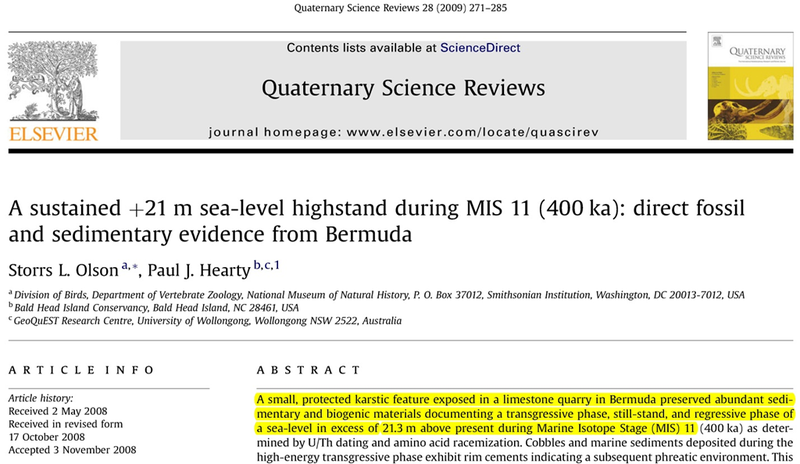 Evidence from New Providence Platform, Bahamas, indicates that it was not a single rise and fall but instead oscillated a minimum of 12 m over a few thousand years." "Beach deposits that are +7.6 m above present sea level on New Providence Island represent the older peak of MIS 5e sea level. A down-stepping beach ridge indicates a subsequent sea-level position at +7.0 m. A calcrete in the subtidal deposits adjacent to the beach documents the mid-MIS 5e sea level drop. In the Exumas, a calcrete associated with this fall separates subtidal facies at -5.2 m. Sea level rises again to form the younger MIS 5e highstand; this rise is represented by a beach ridge at +5.1 m on New Providence Island and Exumas reefs up to +1.5 m above modern sea level. Parallel down-stepping beach to eolian dune transitions provide evidence for a pulsed down-stepping of sea level at the end of MIS 5e. The lowest occurrence of this transition is approximately -12 m below present sea level." "These highstand oscillations recorded in the Bahamas and elsewhere require another, yet unexplained, forcing mechanism of much shorter duration than Milankovitch frequencies but also document rapid climate changes during warm interglacial periods." opine Kelly et al (2012) (paywalled here).
" - The polar temperature decreases in both the North and the South. The slow growth of ice sheets seems to be in phase with or slightly lags the polar temperature decrease, as described by Cortijo et al. (1994, 1999). This ice sheet growth was probably driven by the summer temperature decrease at polar latitudes (Oerlemans 2001) as a consequence of the decreased northern insolation. The obliquity decrease acts as a positive feedback for the ice sheet growth because of the associated increase in low- and high-latitude insolation gradients that enhances the transport of water masses (Fig. 4; Ruddiman and McIntyre 1979; Khodri et al. 2001)." " - The first rapid event (succession of GS 26 and DO 25) is recorded in the northern hemisphere but has no Antarctic counterpart. It is triggered while the CO2 level and ice sheet size are still intermediate between interglacial and full glacial values." "Finally, our proposed sequence of events associated with the glacial inception (simultaneous cooling in north and south and moderate increase in continental ice volume, followed by the CO2 decrease) contrasts with the somewhat different situation during glacial terminations. By comparing the Byrd (Antarctica) and GISP2 records, the Greenland warming during the last termination started slowly 2 k years or less before the initiation of the Antarctic warming (Alley et al. 2002). Then, the Greenland main warming (Bølling-Allerød) occurred only 6 kyears after the beginning of Antarctic warming. Moreover, the analysis of the properties recorded in the Vostok and EPICA Dome C Antarctic cores indicates that during terminations: (1) the temperature at high southern latitude increases only a few hundred years before CO2 (Monnin et al. 2001; Caillon et al. 2003b), (2) the dynamics of the warming was very different between North and South and (3) the northern ice sheet deglaciation occurred several thousand years after the southern warming (Pepin et al. 2001)." "In addition, we propose a relative dating of the Greenland glacial inception with respect to East Antarctic temperature, atmospheric CO2 evolution and global ice sheet growth. According to this dating, the glacial inception involved synchronous cooling at both poles during the initial slow growth of the northern hemisphere ice sheets. Rapid climatic variability in the North Atlantic initiated with DO 25, which seems to be associated with a small temperature change and has no Antarctic counterpart. It occurred before ice sheets reached their glacial maximum extent and while atmospheric CO2 was still relatively elevated. After that event, atmospheric CO2 dropped to glacial levels and NorthGRIP DO 24 and 23 depict characteristics of classical DO (up to +16C for DO 24, i.e. comparable to the DO 19 at the same site; IRD signal; Antarctic counterpart)." "Finally, the rapid climatic variability during the warm and cold phases of DO 23 and 24 suggests that the THC encountered frequent shifts between ''off'' and ''on'' modes. The first rapid event, DO 25, which occurred during the initial ice sheet build-up, suggests a key role for the atmospheric hydrological cycle in climate dynamics. The water cycle influence has already been proved to favour the glacial inception. We show here that it could additionally create a rapid climatic variability when the influence of ice sheets discharge is reduced." "MIS-5e ended abruptly with a rapid transition to glacial conditions, the lake was covered by a layer of firnified snow and ice, and phototrophic biological activity ceased for a period of c. 90,000 years. "Much is known about palaeoenvironments in the northern hemisphere during the MIS5e interglacial. Records show periods of temperatures warmer than today leading to a northward expansion of Mediterranean vegetation in southern Europe and northward expansion of the fauna with animals such as the hippopotamus becoming widespread as far north as Southern England (Williams et al., 1998). With the increased temperatures, the global ice volume declined and far-field coral reefs record eustatic sea levels approximately 5 - 6m higher than today (Lambeck and Chappell, 2001). "In the Antarctic, palaeoenvironmental records of MIS5e are more limited. "Our results suggest that MIS5e was not a stable period as there are two distinct periods of elevated organic and carbonate carbon deposition (Fig. 2b). We speculate that these were short-lived warm periods. Two warm periods (130.7 - 130 and 125.7 - 118.2 kyr BP) have also been detected in Austrian alpine stalagmites (Holzka¨mper et al., 2004). Until there is an appropriate technology for dating MIS5e in these lake sediments we cannot establish if there is a common forcing behind these warm events. The transition from interglacial into glacial conditions was rapid and is represented in its entirety between 26 and 23 cm. This suggests that the end of MIS5e was a relatively sudden event and not a gradual transition to colder conditions. Alkenone sea surface temperature data from the Southern Ocean record this sharp cooling at around 120 kyr BP (Ikehara et al., 1997), marine cores from the Atlantic suggest that it occurred over a period of less than 400 yr, and possibly much shorter (Adkins et al., 1997), and in Greenland the transition took as little as 70 yr (Anklin et al., 1993)." "The transition into glacial conditions was a relatively sudden event. This is supported by marine and ice core records." 1. "Thirty-five new, high-precision, uranium-series ages of fossil corals from the Key Largo Limestone indicate that sea level was significantly above present for at least 9000 years during the Last Interglacial period, and possibly longer. "Older fossil reefs at three localities in the Florida Keys have ages of w200 ka and probably correlate to MIS 7. These reefs imply sea level near or slightly above present during the penultimate interglacial period. Elevation measurements of both the Key Largo Limestone and the Miami Limestone indicate that local (relative) sea level was at least 6.6 m, and possibly as much as 8.3 m higher than present during the Last Interglacial period. "Our elevation measurements from south Florida imply an RSL significantly above present during the LIG. From reefs in the Q5 unit of the Key Largo Limestone on Key Largo, we estimate an RSL of ~6.6 m above present and from Windley Key, ~8.3 m above present, assuming a ~3-m water depth for corals. The Miami Limestone elevations, at least in the Miami area, imply an RSL of 8.1-8.6 m above present during the LIG, assuming an ooid-shoal depth of ~1-m.
"Although it could in principle contribute as much as ~52 m of global sea-level equivalent (Lythe et al., 2001), the EAIS is thought to be relatively stable (Huybrechts and de Wolde, 1999). Using estimates of ice-volume made by Bamber et al. (2001), Greenland could in principle contribute as much as ~7.3 m of global sea-level equivalent. The potential sealevel contribution of the GIS ice sheet in the LIG is constrained by cores from central Greenland that show there is LIG ice, as old as ~123 ka, near the base (North Greenland Ice Core Project Members, 2004). Thus, the LIG contribution of the GIS to global sea level must be something less than 7.3 m."
3. "The oxygen isotopes in the ice imply that climate was stable during the last interglacial period, with temperatures 5C warmer than today. "Our record reveals a hitherto unrecognized warm period initiated by an abrupt climate warming about 115,000 years ago, before glacial conditions were fully developed. This event does not appear to have an immediate Antarctic counterpart, suggesting that the climate see-saw between the hemispheres (which dominated the last glacial period) was not operating at this time. "This high resolution NGRIP record reveals a slow decline in temperatures from the warm Eemian isotopic values to cooler, intermediate values over 7,000 yr from 122 to 115 kyr BP. The end of the last interglacial thus does not appear to have started with an abrupt climate change, but with a long and gradual deterioration of climate. Before full glacial values are reached, however, the record does reveal an abrupt cooling, with a first d18O decrease at about 119 kyr BP, followed by relatively stable depleted d18O levels, which we name here the Greenland stadial 26. The stadial is followed by an abrupt increase at,115 kyr BP, the onset ofDO25 ( reference 37, Fig. 4). NGRIP is the first ice core climate record to so clearly resolve these rapid and large fluctuations in climate right at the beginning of the full glacial period." 4. "Using this record we determine the duration (17.70 ± 0.20 ka) and age of onset (127.20 ± 1.60 ka B.P.) of the last interglacial, as reflected by terrestrial ecosystems. This record also reveals that the transitions at the beginning and end of the interglacial spanned only ~100 and 150 years, respectively. Comparison with records of other earthsystem components reveals complex leads and lags. During the penultimate deglaciation phase relationships are similar to those during the most recent deglaciation, peaks in Antarctic warming and atmospheric methane both leading Northern Hemisphere terrestrial warming. It is notable, however, that there is no evidence at Monticchio of a Younger Dryas-like oscillation during the penultimate deglaciation. Warming into the first major interstadial event after the last interglacial is characterized by markedly different phase relationships to those of the deglaciations, warming at Monticchio coinciding with Antarctic warming and leading the atmospheric methane increase. Diachroneity is seen at the end of the interglacial; several global proxies indicate progressive cooling after ~115 ka B.P., whereas the main terrestrial response in the Mediterranean region is abrupt and occurs at 109.50 ± 1.40 ka B.P. "Finally, the very abrupt end of the LI, that occurred within no more than 0.15 ka (Fig. 3b), but that lagged by ~6.3 ka the onset of long-term decreases in SST, Vostok dD and CH4 and increase in global ice volume, once again indicates a nonlinear response and suggests important threshold processes." 5. Between 115 and 110 ka, the substantial ice accumulation in northern high latitudes (MIS 5e/5d transition) was synchronous with successive drops, C26 and C25, in northeastern Atlantic SST. In northwestern Iberia Abies-Pinus trees developed at the expense of Quercus-Carpinus forest. A tundra-like environment occupied northern Germany, marking the end of the interglacial in northwestern Europe at 115 ka, and boreal forest likely colonised northeastern France. The first displacement of the vegetation belts at 121 ka was enhanced at 115 ka indicating an amplification of the vegetation and climate gradients in northeastern Atlantic and European borderlands probably related with the well-developed ice caps at that time. 6. "Using this record we determine the duration (17.70 ± 0.20 ka) and age of onset (127.20 ± 1.60 ka B.P.) of the last interglacial, as reflected by terrestrial ecosystems. This record also reveals that the transitions at the beginning and end of the interglacial spanned only ~100 and 150 years, respectively. 7. "Until a few decades ago it was generally thought that large-scale global and regional climate changes occurred gradually over a timescale of many centuries or millennia, scarcely perceptible during a human lifetime. The tendency of climate to change relatively suddenly has been one of the most surprising outcomes of the study of earth history, specifically that of the last 150,000 years (e.g., Taylor et al., 1993). Some and possibly most large climate changes (involving, for example, a regional change in mean annual temperature of several degrees celsius) occurred at most on a timescale of a few centuries, sometimes decades, and perhaps even just a few years. "The beginning of crop agriculture in the middle east corresponds very closely in time with a sudden warming event marking the beginning of the Holocene (Wright, 1993). The burial in ice of the prehistoric mummified corpse of the famous 'Iceman' (e.g., Bahn and Everett, 1993) at the upper edge of an alpine glacier coincided with the initiation of a cold period ('Neoglaciation') after the Holocene climate optimum (Baroni and Orombelli, 1996)." 8. "With polar temperatures 3 - 5C warmer than today, the last interglacial stage (~125 kyr ago) serves as a partial analogue for 1 - 2C global warming scenarios." "We find a 95% probability that global sea level peaked at least 6.6m higher than today during the last interglacial; it is likely (67% probability) to have exceeded 8.0m but is unlikely (33% probability) to have exceeded 9.4 m. When global sea level was close to its current level (~10 m), the millennial average rate of global sea level rise is very likely to have exceeded 5.6m kyr-1 but is unlikely to have exceeded 9.2m kyr-1. Our analysis extends previous last interglacial sea level studies by integrating literature observations within a probabilistic framework that accounts for the physics of sea level change." "The results of our analysis support the common hypothesis that LIG GSL was above the current value, but contrary to previous estimates, we conclude that peak GSL was very likely to have exceeded 6.6m and was likely to have been above 8.0 m, though it is unlikely to have exceeded 9.4 m. The LIG was only slightly warmer than present, with polar temperatures similar to those expected under a low-end 2C warming scenario. Nonetheless, it appears to have been associated with substantially smaller ice sheets than exist at present. Achieving GSL in excess of 6.6m higher than present is likely to have required major melting of both the Greenland and the West Antarctic ice sheets, an inference supported by our finding that both Northern and Southern hemisphere ice volumes are very likely to have shrunk by at least 2.5 m.e.s.l. relative to today. Incorporating a large database of palaeoclimatic constraints thus highlights the vulnerability of ice sheets to even relatively low levels of sustained global warming." 9. "Sea level was 6-7 m higher than present during the last interglacial highstand 125,000-115,000 years before present (MIS 5e). Evidence from New Providence Platform, Bahamas, indicates that it was not a single rise and fall but instead oscillated a minimum of 12 m over a few thousand years." 10. "The results from these subsets were fairly consistent. Across all subsets, the median projection peaked between 6.4 and 8.7 m. With the exception of the subset containing only erosional features, the 95% probability exceedance value ranged from 5.7 to 7.0 m, the 67% probability value ranged from 7.3 to 8.7 m, and the 33% probability value ranged from 8.4 to 10.5 m. (The values for the subset containing only erosional features were slightly lower and more broadly spread, with 95%, 67% and 33% values of 20.3 m, 3.9 m and 6.8 m, respectively." "Our results suggest that during the interval of the LIG when sea level was above -10 m, the rate of sea level rise, averaged over 1 kyr, was very likely to have reached values of at least about 5.6 m kyr-1 but was unlikely to have exceeded 9.2 m kyr-1. Our data do not permit us to resolve confidently rates of sea level change over shorter periods of time." "The results from the LIG suggest that, given a sufficient forcing, the present ice sheets could sustain a rate of GSL rise of about 56 - 92 cm per century for several centuries, with these rates potentially spiking to higher values for shorter periods." "The results of our analysis support the common hypothesis that LIG GSL was above the current value, but contrary to previous estimates, we conclude that peak GSL was very likely to have exceeded 6.6m and was likely to have been above 8.0 m, though it is unlikely to have exceeded 9.4 m.
"The LIG was only slightly warmer than present, with polar temperatures similar to those expected under a low-end, 2C warming scenario. Nonetheless, it appears to have been associated with substantially smaller ice sheets than exist at present. Achieving GSL in excess of 6.6m higher than present is likely to have required major melting of both the Greenland and the West Antarctic ice sheets, an inference supported by our finding that both Northern and Southern hemisphere ice volumes are very likely to have shrunk by at least 2.5me.s.l. relative to today. Incorporating a large database of palaeoclimatic constraints thus highlights the vulnerability of ice sheets to even relatively low levels of sustained global warming." 11. "Marine and continental records from the Northern Hemisphere have shown that the last glacial period was characterized by rapid climatic variability (e.g. Bond et al. 1993; Genty et al. 2003). The GRIP and GISP2 ice cores (Dansgaard et al. 1984, 1993; Grootes et al. 1993) depict a continuous and high-resolution record of such climatic variability associated with large temperature changes over Greenland (up to 16°C within ~100 years; Lang et al. 1999)." "The rapid temperature increase associated with the DO 25 marks the onset of the rapid climatic variability in the North Atlantic. Before this event, the NorthGRIP d18Oice and Vostok dD profiles first show a common cooling during 10 kyears. The phasing, however, cannot be firmly established because of the ±2,500 years uncertainty in the relative timescales." "Using that temperature reconstruction, the Antarctic cooling is slightly delayed and suggests that the main Antarctic temperature decrease occurred only 2 - 3 k years after the main Greenland temperature decrease (Fig. 4), which still lies within our uncertainty range." 12. "Last interglacial ended approximately 115 thousand years ago, when the Norwegian warm current was substantially reduced and the dominant near-meridional circulation in Europe turned into near-zonal. Sites in southwestern Europe continued to experience temperate climate. Build-up of the Early Glacial ice was accompanied by the warming of equatorial ocean. Some features of the seasonal and geographic distribution of recent temperature and precipitation anomalies indicate that the cause of the ongoing global warming has a significant natural component." · inject a lot of sequestered carbon into the late Holocene atmosphere/ecosphere because "Frankly my dear, [the climate] could not give a dam"
There were four interglacials in the last half million years and ours is the fifth one. Past interglacials invariably ended with the increase of solar energy income to low latitudes in boreal spring, compensated by decrease to high latitudes in autumn. The change was caused by orbital shift. A qualitatively similar shift is taking place now (Kukla et al., 1992). 3) -gradually turn into a colder world following the orbitally driven blueprint of past interglacials, only in part modified by the artificial increase of greenhouse effect." "Thus it is not only impossible, but highly probable that the early stage of the last glacial was marked by warming of low latitude oceans." Summarizing, the last interglacial ended at the MIS 5e/5d boundary some 115 or 116 ka ago. "Several features of the last interglacial/glacial transition resemble the recent temperature and precipitation trends. 1) Preferential warming of the low latitudes. 4) Cooling of the northern North Atlantic with simultaneous warming of the equatorial one. "While some of the above features may be due to the increase of man-made greenhouse gases, they may also indicate that the natural redistribution of shortwave radiation is already affecting the ongoing climate change (Kukla et al., 1992). However no increase of ice volume, nor a decrease of mean sea level have yet been observed." During most of the Eemian interglacial (ca. 126 - 115 ka), the North Atlantic Current extended far north into the Nordic Seas and European environments were comparable to those of the Holocene. However, ca. 115 ka an SST drop in the Nordic Seas marked a southward displacement of the North Atlantic Current. This hydrographic shift was associated with substantial cooling in northern Europe and drier conditions in the Mediterranean region. The polar timberline retreated southward from 69N in northernmost Scandinavia to 52N in central Europe, and thermophilous deciduous trees became extinct north of the 48th parallel. Woodlands persisted in southern Europe for another 5 k.y. well into marine isotope substage 5d. These conditions indicate steep vegetation and climate gradients at the inception of the last glacial. Shifts in terrestrial ecosystems are reconstructed from pollen records as the vegetation response to climate changes is pronounced and relatively fast. Between 123 and 116 ka, the northern limit of woods dominated by thermophilous trees was at 60N in southern Sweden (Robertsson, 2000), and the polar timberline was at 69N between the sites Kijarvet and Leveaniemi (Robertsson, 1991) in northernmost Scandinavia (Fig. 2A). This configuration of Atlantic circulation and European vegetation resembles the present-day situation (Fig. 2A). The marine records show decreased SSTs in the Nordic Seas ca. 115 ka. However, surface waters remained warm for at least another 5 k.y. in the subpolar North Atlantic southwest of the Iceland-Scotland Ridge. This contrast marks a strong increase of the meridional SST gradient during this interval. We conclude that the North Atlantic Current had ceased to penetrate into the Nordic Seas. The event, labeled C26, occurred at the transition from marine isotope stage (MIS) 5e to 5d. Data from a core on the Bermuda rise, located at the mixing zone of North and South Atlantic deep water, show a pronounced decline of the North Atlantic deep-water component at the MIS 5e to 5d transition within a period of 200 yr (Lehman et al., 2002). At sites in southern Europe (e.g., Les Echets, Tenaghi Philippon) we see a reduction of thermophilous trees after C26 owing to insufficient moisture rather than lack of summer warmth (Tzedakis, 2003). It has been hypothesized that the disappearance of tree populations in northern Europe ca. 115 ka may have been caused by orbital changes that reduced insolation in the growing season (Tzedakis, 2003). Such insolation changes are, however, very slow. Most likely the continuously decreasing high-latitude radiation in concert with expanding ice cover, associated albedo feedback, and increased freshwater input into the Nordic seas forced the system to cross a critical threshold. Such a shift would have triggered the abrupt displacement of the North Atlantic Current with its associated impact on terrestrial environments in Europe. Variable climatic and oceanographic conditions characterized the last interglacial at high northern latitudes, probably related to changes in the strength of the Atlantic Meridional Overturning Circulation (AMOC). The magnitudes of these changes are comparable to the Holocene variability, and were thus significantly subdued compared to glacial climate changes. A thermal optimum occurred during the early part of the interglacial, followed by a period of reduced Atlantic inflow to the northernmost Nordic Seas. Subsequently, a new period with increased strength of the AMOC occurred. Significant amounts of Ice-Rafted Debris (IRD) were deposited in the northernmost Nordic Seas before any major change of the global ice volume. This implies an early onset of local ice sheet growth, probably the result of enhanced inflow of Atlantic water to the northernmost Nordic Seas contemporary with a Northern Hemisphere summer insolation minimum. Contrasting sea - land conditions provided large moisture fluxes towards land, giving rise to rapid, early glacial growth. The onset of a new glaciation following the last interglacial has been considered as a response to a continuous decrease of Northern Hemisphere summer solar insolation, leading to colder atmospheric and surface ocean conditions in the Arctic region, decreasing evaporation, and expansion of sea ice and snow fields and associated feedbacks. Consequently, the surface water in the Nordic Seas was freshened and the production of Norwegian Sea Deep Water may have decreased as a response to these changes [e.g. Imbrie et al., 1992; Khodri et al., 2001]. In accordance with this, Cortijo et al. reason that cooling of the Norwegian Sea and the North Atlantic preceded growth of the continental ice sheet. Atmospheric general circulation model studies indicate that the initiation of permanent snow cover and the growth of ice sheets is favored by colder sea-surface conditions [Yoshimori et al., 2002]. However, warm interglacial conditions and strong convection prevailed through the inception phase in the subpolar North Atlantic [Duplessy and Shackleton, 1985; Ruddiman and McIntyre, 1979; Ruddiman et al., 1980]. It has been argued that the moisture necessary to obtain the rapid ice accumulation of the Laurentide and Scandinavian ice sheets was provided by increased storminess resulting from the contrast between these warm water masses and the colder land and ice-covered regions, as the temperature gradient between polar and subpolar areas increased. Several recent papers also argue in favor of an intensified Atlantic Meridional Overturning Circulation (AMOC) during the glacial inception phase, stressing the importance of direct influence of AMOC on the high northern latitude climate during glacial growth [McManus et al., 2002; Otterå and Drange, 2004 (in press); Wang and Mysak, 2002]. The majority of studies that focus on the penultimate glacial inception, however, are based on reconstructions of subpolar areas. Thus, it is of great importance to document the glacial inception history as recorded in the polar region, where feedbacks related to an early change in ice albedo might be important. In the present situation, strengthened NwAC is characterized by a restricted lateral extent of warm Atlantic water, as compared to a more widespread but shallower extent at times of a reduced NwAC [Blindheim et al., 2000]. Changes in the strength of the NwAC are primarily the result of changing strength of the westerlies. Our results indicate an intensified AMOC from 117 ka BP. Warm water conditions together with an increased content of the Arctic front indicator G. quinqueloba are recorded in MD99-2304, while MD99-2303 was probably bathed by Arctic water. These conditions with a strong AMOC occur at the same time as the summer insolation at 65°N approached its minimum (Figure 6). The enhanced warming characterizing the end of the warm phase of MIS 5.5 at MD99-2304 culminated in a marked cooling, registered by a rapid fall of the relative content of subpolar foraminifers and increased planktonic δ18O values (Figures 5 and 6a). Immediately after this warm phase, the first major IRD input is recorded in the Fram Strait (Figures 4b,c and 5). This first IRD input coincides with the first MIS 5 global change in ice volume, as indicated by benthic δ18O from NEAP18K (Figure 4a-c) [Chapman and Shackleton, 1999], and with the dated onset of global fall in sea level [Stirling et al., 1998], according to our time scale used in this paper. Thus, glaciers at Spitsbergen grew large enough to reach the coastline and calve before any major global ice sheet growth was observed. The combination of low insolation and strengthened influx of warm water probably favored this rapid growth of the Svalbard - Barents Sea Ice Sheet (SBIS). An increased thermal contrast between sea and land at high latitudes will produce large moisture fluxes towards land [Wang and Mysak, 2002], and a steady source of moisture is needed to provide major glacial growth [Hebbeln et al., 1994; Nesje and Dahl, 2003]. We suggest that warm open water conditions at times of reduced summer insolation initiated the growth of ice on land through the inception phase, while the further development of grounding of ice at the epicontinental Barents and Kara Sea was dependent on the global sea level as well. The possible effect of a strong AMOC late in MIS 5.5 and its potential influence on the initial glacial growth at high northern latitudes was noted by McManus et al. . The importance of the different mechanisms probably changed through time, depending on the present boundary conditions of the climate system. However, the widespread distribution of these cold spell events (C19 - C25 [Chapman and Shackleton, 1999; McManus et al., 1994]) along the axis of the Gulf Stream and its subsequent warm northward-flowing currents accentuates the importance of the ocean dynamics and its influence on the climate system. From the results from core MD99-2304, it appears that at times even slight changes in the water mass configuration may destabilize a marine-based ice sheet. Hall et al. showed that a vigorous behavior of the AMOC did characterize at least the glacial inception phase and the period into MIS 5.4. At the periods with major calving of the Northern Hemisphere ice sheets, large amounts of freshwater were introduced to the main areas of deep-water formation, both in the Nordic Seas and in the Labrador Sea. Increased freshwater flux to these sensitive areas most probably perturbed the deep-water formation and weakened the AMOC [e.g. Clark et al., 2002; Ganopolski and Rahmstorf, 2001; Manabe and Stouffer, 1997]. A reorganization of the deep-water circulation related to the North Atlantic IRD events has been documented [Chapman and Shackleton, 1999; Hall et al., 1998; and Lehman et al., 2002], supporting the interpretation of a weakened AMOC as a response of the increased freshwater influx. The regional impact of a weakened AMOC will be large. Generally colder conditions will be induced in the Nordic Seas, the North Atlantic, and surrounding areas [Manabe and Stouffer, 1997]. Such coolings are documented by several paleoclimatic studies, e.g. the regionally distributed IRD events are associated with cold atmospheric temperatures at Greenland [Bender et al., 1994] and cold sea-surface conditions in both the subpolar North Atlantic [McManus et al., 1994] and the subtropical North Atlantic [Lehman et al., 2002] (Figure 8a-d). In general, the MIS 5.5 climate seems to have been relatively unstable due to variable AMOC. Nevertheless, the amplitude of this variability was much smaller than glacial climate changes. Glaciers at Spitsbergen grew large enough to initiate major calving before any large global changes in ice volume occurred. This early glacial inception was initiated by the strong sea - land temperature gradient resulting from the contemporary warm sea-surface and summer insolation minimum. This maintained significant moisture fluxes toward land, concomitant with reduced summer melting, which resulted in rapid glacier growth. We also propose that similar conditions were important for the initiation of glacier growth in high Northern Russia, related to an intensified deflection of Atlantic water into the Barents Sea when the AMOC is strengthened. "We investigated deep water changes in the Southern Ocean during the last glacial inception, in relationship to surface hydrology and global climatology, to better understand the mechanisms of the establishment of a glacial ocean circulation. Changes in benthic foraminiferal d13C from three high-resolution cores are compared and indicate decoupled intermediate and deep water changes in the Southern Ocean. From the comparison with records from the North Atlantic, South Atlantic, and the Southern Ocean, we show that the early southern deep water d13C drop observed at the MIS 5.5 - 5.4 transition occurred before any significant reduction of North Atlantic Deep Water ventilation. We propose that this drop is linked to the northward expansion of poorly ventilated Antarctic Bottom Water (AABW) mass in the Southern Ocean. Associated with an early cooling in the high southern latitudes, the westerly winds and surface oceanic fronts would migrate equatorward, thus weakening the upwelling of Circumpolar Deep Waters. Reduced heat brought to Antarctic surface waters would enhance sea ice formation during winters and the deep convection of cold and poorly ventilated AABW." "Different mechanisms have been proposed, associated with a rapid switch from Northern Component Waters to Southern Component Waters at mid depths in the South Atlantic [Molyneux et al., 2007], or emphasizing the key role of the subtropical front as amplifier and vehicle for the transfer of climatic change to the Southern Ocean [Cortese et al., 2007]. But published data are insufficient to give the necessary integrated view of the Southern Ocean circulation changes and associated mechanisms during the last glacial inception." "Therefore, North Atlantic Deep Waters ventilation did not change significantly before the beginning of the glacial period (MIS 4)." "This indicates that, during the entire stage 5, a well-ventilated NADW was reaching the South Atlantic, at least above 3000 m, and entering the Southern Ocean, before mixing with Pacific/Indian deep waters." "These d13C shifts have been interpreted as an increased influence of poorly ventilated AABW in the deep North Atlantic and shoaling of NADW." "This suggests a progressive northward expansion of the boundary of a poorly ventilated water mass, with low d13C values (likely equivalent to AABW), from the southern sites to the northern sites. Moreover, the northern sites, which show higher d13C values than in the southern cores throughout MIS 5 and 4 (Figure 7b), appear closer to the zone of transition (strong d13C gradient) between poorly ventilated AABW and better ventilated CDW." "This suggests an equatorward shift of the oceanic surface fronts [Howard and Prell, 1992; Labeyrie et al., 1996]. The subantarctic front may have experienced a more pronounced northward shift than the subtropical front. Or it could have shifted in between the northern and southern cores locations, thus inducing a steeper meridional SST gradient." "This indicates that the equatorward shift of oceanic surface fronts and the associated climate changes may have induced the progressive northward expansion of poorly ventilated AABW in the deep Southern Ocean." "The oceanic circulation of the last Interglacial period (MIS 5.5) (Figure 8a) was similar to the modern one [Duplessy et al., 2007; Duplessy and Shackleton, 1985; Evans et al., 2007]. We suggest that the early cooling observed in the high southern latitudes cores during MIS 5.5 (Figures 5a and 5b) induced an equatorward shift of the westerlies and associated oceanic fronts (Antarctic divergence, polar and subantarctic fronts) [Toggweiler et al., 2006]." "Such link is suggested by several indicators: glacial simulations with an atmospheric model (equatorward shift of the westerlies of 7° for a 3K cooling) [Williams and Bryan, 2006], paleoclimatic reconstructions (e.g., shift of the westerlies from ~50°S presently to ~41°S during glacial times in South America [Moreno et al., 1999]), and by modern observations (a poleward shift of the westerlies is observed over the last 40 years) [Hurrell and van Loon, 1994; Shindell and Schmidt, 2004]." "A comparison over the last glacial inception of three cores representing different Southern Ocean water masses suggests a decoupling between intermediate and deep water changes in the Southern Ocean." "We also show that these Southern Ocean deep water changes lag the cooling observed in subantarctic surface waters. We propose a succession of ocean-atmosphere feedbacks, in reaction to the early cooling observed in the high southern latitudes. Surface cooling at the MIS 5.5 - 5.4 transition would be associated with an equatorward shift of oceanic surface fronts and the westerlies, which moved away from the Antarctic divergence. The upwelling of Circumpolar Deep Waters would be reduced [Toggweiler et al., 2006]. Both decreased heat brought to circumpolar surface waters and cooling in the high southern latitudes would enhance winter sea ice formation [Hellmer, 2004]. This would increase the related brine release and enhance deep convection of cold and poorly ventilated AABW." "The Pleistocene record suggests that modern insolation is not much above that needed for glacial inception. However, the complexity of the climate response to the complex astronomical forcing implies that further theoretical elaborations are needed to transform this statement into a reliable prediction about the slow evolution of climate like: 'greenhouse gas should have declined during the Holocene, leading to glacial inception'. In particular, there is no perfect insolation analogue to the Holocene in the past and, would there be one, it cannot be guaranteed that climate would behave exactly the same way as during that hypothetical analogue. We mentioned several reasons for this. One is the possibility that small disturbances may, at strategic times, delay glacial events by several thousands of years. Locating such 'high-sensitivity' times is an attractive challenge. If the Holocene was such a time, any small disturbance, including the pre-industrial anthropogenic activity, may have durably inflected the course of climate." "The transition between the Last Interglacial (hereafter Marine Isotopic Stage 5.5, ~129 - 116 thousand years before present (ka)) into the first stage of the last glacial period (MIS 5.4, 116 - 105 ka) is the only glacial inception recorded in Greenlandic ice cores [NorthGRIP Community Members, 2004]." Still, high-resolution data do not show the precise North Atlantic sequence of events over the last glacial inception and how this is linked to climatic and environmental changes in the lower latitudes. Here we employ the NorthGRIP record to report a detailed picture of the onset of the rapid climatic variability in Greenland and in the lower latitudes based on new high-resolution (centennial to sub-decadal) profiles of a wide range of parameters measured on both ice and air trapped in ice (Figure 2 and Table 1). We first present new high-resolution d18Oice measurements covering the glacial inception between 108 and 123 ka (Figure 2 and Table 1). Two abrupt increases of d18Oice are objectively identified in this time interval and quantified using the RAMPFIT software [Mudelsee, 2000]. This weighted least-squares method estimates the level of the d18Oice for stadial and interstadial conditions, a linear trend between the change points, and a measure of the uncertainty of these estimated change points based on a set of 400 bootstrap simulations for each abrupt event. The onset of GIS 25 is characterized by a d18Oice increase of 1.12 ± 0.05 ‰ and the end of GIS 25 is punctuated by a second abrupt d18Oice increase of 1.51 ± 0.04‰. This sub-event is referred later as GIS 25 s. These magnitudes are significantly reduced in comparison to subsequent GIS onsets (Figure 1). Our new high resolution d15N profile reveals an increase of 0.044‰ at GIS 25 onset. Using the firn densification model from Goujon et al. , the best fit between measured and modelled d15N is obtained for a warming of 3 ± 2.5C. The warming at the onset of GIS 25 occurs in 180 years and is three to up to five times smaller than for the subsequent abrupt events [e.g., Landais et al., 2006]. We also show that GIS 25 is then terminated by a previously undocumented short warm event, GIS 25 s, lasting 300 ± 90 years with a amplitude of 5 ± 2.5C (Figure 2). In contrast, no clear CH4 signal is associated with the d15N peak marking DO 25. Indeed, a 47 ± 11 ppbv CH4 increase is concurrent to GIS 25 onset, an amplitude also encountered during two other CH4 peaks identified during GS 26 and GIS 25 when no significant Greenland temperature change is registered. This contrasts with the CH4 shifts between 80 to 200 ppbv that are associated with the glacial DO events [Chappellaz et al., 1993] (Figure 2). Such a small CH4 increase could result from the fact that the temperature rise at the onset of GIS 25 is also significantly smaller than the one observed for the subsequent rapid events as the temperature sensitivity of the CH4 change at the onset of GIS 25 is in the observed range of later rapid events. But the fact that there are other CH4 signals of similar strength without a corresponding temperature shift points to an additional temperature-independent driver of CH4 changes during glacial inception. The reduced CH4 change at the onset of GIS 25 compared to later rapid events indicates that neither boreal nor tropical CH4 sources significantly responded to this abrupt warming. This result suggests that there is not a simple coupling between high-latitude temperature and ITCZ shifts during abrupt climatic events that holds for all time periods. "One such region is the Mediterranean, located at the transition between the dry Hadley cell atmospheric circulation north of the Inter-Tropical Convergence Zone, and the turbulent moisture-bearing westerly flow of the higher latitudes." While the Arctic region has been warming strongly in recent decades, anomalously large snowfall in recent winters has affected large parts of North America, Europe, and east Asia. Here we demonstrate that the decrease in autumn Arctic sea ice area is linked to changes in the winter Northern Hemisphere atmospheric circulation that have some resemblance to the negative phase of the winter Arctic oscillation. Moreover, the increase in atmospheric water vapor content in the Arctic region during late autumn and winter driven locally by the reduction of sea ice provides enhanced moisture sources, supporting increased heavy snowfall in Europe during early winter and the northeastern and midwestern United States during winter. We conclude that the recent decline of Arctic sea ice has played a critical role in recent cold and snowy winters. During the past few winters, North America, Europe, and east Asia have experienced anomalously cold conditions, along with record snowfalls (1 - 3). Anomalously heavy snowfall wrought havoc in large parts of the United States and northwestern Europe for the winters of 2009 - 2010 and 2010 - 2011. A series of snowstorms hit central and southern China for the winter of 2007 - 2008. As shown in Fig. S1, significantly above-normal winter snow cover has been present in large parts of the northern United States, northwestern and central Europe, and northern and central China for the four winters since the record low Arctic sea ice during 2007. However, no clear persistent out-of-phase NAO/AO-snow cover and in-phase El Niño-snow cover relationship are evident in the observations for the past four winters (Fig. S2). Diminishing Arctic sea ice and its potential climatic impacts have received increasing attention (10 - 12); i.e., many studies have demonstrated that regional loss of Arctic sea ice can have hemispheric consequences in atmospheric circulation (13 - 19). Recent studies show that cold conditions and increased snow cover over Siberia in autumn are correlated with reduced September sea ice cover in the Pacific sector of the Arctic (20, 21). Furthermore, Fig. S2 does support a persistent out-of-phase sea ice-snow cover relationship for the past four winters. Here we extend previous studies by combining observational data analyses and numerical experiments, demonstrating how anomalously large snowfall in large parts of the Northern Hemisphere continents in recent winters are linked to diminishing Arctic sea ice. When highly reflective sea ice is replaced by open water during the ice melting period, there is a substantial solar heat input directly into the ocean, increasing the heat stored in the upper ocean. Warming of the upper ocean retards the recovery of sea ice during the fall freeze-up. As a result, the ice coverage in late autumn and early winter for the past few years is significantly below the mean of 1979 - 2000, exceeding two standard deviation of ice variability (Fig. S3). A decrease of autumn Arctic sea ice of 1 million km2 corresponds to a significantly above-normal winter snow cover (>3-12%) in large parts of the northern United States, northwestern and central Europe, and northern and central China (Fig. 1B). One important contributor to the anomalously large snowfall in recent winters is changes in atmospheric circulation linked to diminishing Arctic sea ice. The regression map between sea ice area and sea level pressure (SLP) reveals that following anomalously low ice coverage in autumn, the winter SLP is substantially higher over the Arctic Ocean, the northern Atlantic, and much of high-latitude continents, which is compensated by lower SLP in midlatitudes (Fig. 2A). This pattern shows some resemblance to the negative phase of the winter AO (Fig. 2B). However, some significant differences are noticed. First, the pattern linked to the reduction of autumn sea ice shows broader meridional meanders in midlatitudes rather than the zonal symmetry associated with the winter AO pattern (Fig. 2 A vs. B). A recent study also noted that recent loss of summer sea ice in the Arctic is directly connected to a shift to a more meridional atmospheric circulation pattern in the following autumn and suggested that increased modification of atmospheric circulation pattern would be anticipated with continuing loss of summer sea ice to less than 20% of its climatology over the next decades (26). Second, the pattern linked to the reduction of autumn sea ice shows clearly different interannual variability relative to the classical winter AO pattern; i.e., the detrended autumn Arctic sea ice and winter AO indices have weak correlation (0.28), only accounting for approximately 8% of the shared variance. Thus, the atmospheric circulation change linked to the reduction of sea ice is different from the classical AO. This suggests a shift to a more meridional anomalous wind pattern in winter congruent with the reduction of the autumn Arctic sea ice. Weak westerly winds tend to enhance broader meanders that are likely to form blocking circulations. Fig. 3A shows that associated with the reduction of autumn sea ice, there is an increased incidence of blockings during winter over much of northern high-latitude continents, with the most pronounced increase in eastern Europe, central Siberia, southern Alaska, and the northwestern United States (20 - 60% greater than climatology). These blocking patterns favor more frequent incursions of cold air masses from the Arctic into mid- and low-latitude of northern continents. As shown in Fig. 3B, there is an increased frequency of cold events over much of northern continents, with the most pronounced increase in the eastern and Midwestern United States, northwestern Europe, between mid-east and central Asia, and central and south China (20 - 60% greater than climatology). This leads to cold conditions over much of northern continents; i.e., temperature anomalies extending southeastward from northwestern Canada to the southeastern United States, and eastward/southeastward from northwestern Europe to central China can be 2 - 3 °C below-normal in association with 1 million km2 decrease of the autumn Arctic sea ice (Fig. 2C). Another potential contributor to anomalously large snowfall in recent winters is changes in atmospheric water vapor content over northern high latitudes. The rapid retreat of sea ice in summer and slow recovery of sea ice in autumn, particularly after 2007, greatly enhances moisture flux from the ocean to the atmosphere. This increases the humidity of Arctic air masses remarkably during ice growth period. Following anomalously low ice coverage in autumn, the regions with the most pronounced increase of specific humidity (integrated from surface to 700 hPa) during late autumn and early winter are found in northern/eastern Europe, far eastern Siberia, and western Alaska (Fig. 3C). The increase of humidity in autumn provides an additional local moisture source to Europe, in addition to circulation change induced moisture transport from midlatitudes through shifting the storm track southward and increasing storminess over the Mediterranean (Fig. 2A). This further indicates that the moisture source in Europe (northeastern North America) might be primarily locally driven in late autumn and early winter (winter) and switches from locally driven to moisture transport from lower latitudes in early winter (late winter). The results of this study add to an increasing body of both observational and modeling evidence that indicates diminishing Arctic sea ice plays a critical role in driving recent cold and snowy winters over large parts of North America, Europe, and east Asia. The relationships documented here illustrate that the rapid loss of sea ice in summer and delayed recovery of sea ice in autumn modulates not only winter mean statistics (i.e., snow cover and temperature) but also the frequency of occurrence of weather events (i.e., cold air outbreaks). While natural chaotic variability remains a component of midlatitude atmospheric variability, recent loss of Arctic sea ice, with its signature on midlatitude atmospheric circulation, may load the dice in favor of snowier conditions in large parts of northern midlatitudes. If the decline of Arctic sea ice continues as anticipated by climate modeling results (31, 32), we speculate that episodes of the aforementioned circulation change will become more frequent, along with more persistent snowstorms over northern continents during winter. · In contrast to the slow waltz of climate into glacial inception some proselytize, the ends of the interglacials appear to occur quite suddenly. The range being something on the order of 70-200 years. Which means that glacial inception, which should have already happened according to some, could actually occur during the 21st century. - Preferential warming of the low latitudes. - Increasing meridional temperature gradient. - Increasing precipitation in cold season in the high northern latitudes (which supposedly also accompanied the ice build-up in MIS 5d). - Cooling of the northern North Atlantic with simultaneous warming of the equatorial one. I would like to crowdsource Kukla's 2000 indicators to those who can demonstrate expertise in addressing them. · Risebrobakken et al (2005) provide these pieces: "However, warm interglacial conditions and strong convection prevailed through the inception phase in the subpolar North Atlantic [Duplessy and Shackleton, 1985; Ruddiman and McIntyre, 1979; Ruddiman et al., 1980]." "During the inception and growth phases, it seems essential that there be warm ocean surfaces to provide the moisture (Barry 1966)" Andrews and Barry, 1978. "These conditions with a strong AMOC occur at the same time as the summer insolation at 65°N approached its minimum"
The combination of low insolation and strengthened influx of warm water probably favored this rapid growth of the Svalbard - Barents Sea Ice Sheet (SBIS). An increased thermal contrast between sea and land at high latitudes will produce large moisture fluxes towards land [Wang and Mysak, 2002], and a steady source of moisture is needed to provide major glacial growth [Hebbeln et al., 1994; Nesje and Dahl, 2003]. "We suggest that warm open water conditions at times of reduced summer insolation initiated the growth of ice on land through the inception phase" "This early glacial inception was initiated by the strong sea - land temperature gradient resulting from the contemporary warm sea-surface and summer insolation minimum. This maintained significant moisture fluxes toward land, concomitant with reduced summer melting, which resulted in rapid glacier growth" Risebrobakken et al (2005). "We suggest that the early cooling observed in the high southern latitudes cores during MIS 5.5 (Figures 5a and 5b) induced an equatorward shift of the westerlies and associated oceanic fronts (Antarctic divergence, polar and subantarctic fronts) [Toggweiler et al., 2006]." "....paleoclimatic reconstructions (e.g., shift of the westerlies from ~50°S presently to ~41°S during glacial times in South America [Moreno et al., 1999]), and by modern observations (a poleward shift of the westerlies is observed over the last 40 years) [Hurrell and van Loon, 1994; Shindell and Schmidt, 2004]." In one sense I offer this compilation as a sort of extension to Liu et al (2014), whom came very close, I think, to "getting it". Liu et al (2014) provide an almost blow by blow account of many of the things now thought to characterize glacial inceptions. It seems as if they almost took the last step, as we have done here, in looking at what it all might very well mean. The arctic warms, melts, causes a delay in re-freezing, which allows that much more moisture evaporation to feed into such things as blocking highs, resulting in severe winter storms laden with more moisture to provide thick blankets of snow in the northern continental latitudes. The further south and longer the heavy snows persist, like the past few winters, the orbital weakened/weakening incoming solar radiation (insolation) is reflected, not absorbed. Obviously it is far more complex than that, but that very well might be the gist of the matter. Scholarly thoughts on these matters are solicited. · For over two decades now the IPCC and academia have studied anthropogenic global warming. I have yet to see where they consider the climatic "madhouse" known as glacial inception and whether or not we could be anywhere close to such, with the possible exception of Loutre and Berger (2003). Instead we have focused very hard on AGW, which could cause climate to quickly, catastrophically, and perhaps unrecoverably reach the absolute reference standard of climate, sea level, to somewhere from just shy of 1% to just over 10% of what gaia did anyway at the end of the last interglacial. The logical absurdity here should be obvious. The largest climate problem of all is actually the smallest one we think we can now can identify: AGW (see every issuance from the IPCC). That is patently absurd. · Then there is the problem of recognizing the AGW "signal" from the natural background "noise" which can contain at least 2-3 thermal pulses from 1 to almost 2 orders of magnitude higher at the ends of the post-MPT interglacials. What will our "signal" look like? What will our "signal" looked like submerged in 1 to say 2 orders of magnitude stronger noise, noise that can contain so far up to 3 such peaks? By what method does anyone propose to isolate such an obviously weak signal from the obviously much larger "noise" envelope? Whereas this may not qualify as patently absurd (I am certainly open to signal processing experts chiming in here), it seems only a hair shy to me at this point. · In what may just be the largest logical absurdity of the entire CO2/GHGs/etc. debate/non-debate/discussion is if the IPCC et al ad infinitum are correct about CO2/GHGs/etc. then Ruddiman (2003) might also be correct. In which case we have already cheated glacial inception for perhaps thousands of years already, and now "we", supposedly ~97%, want to take it out? Let me make sure I get this straight, because this cannot be had both ways. 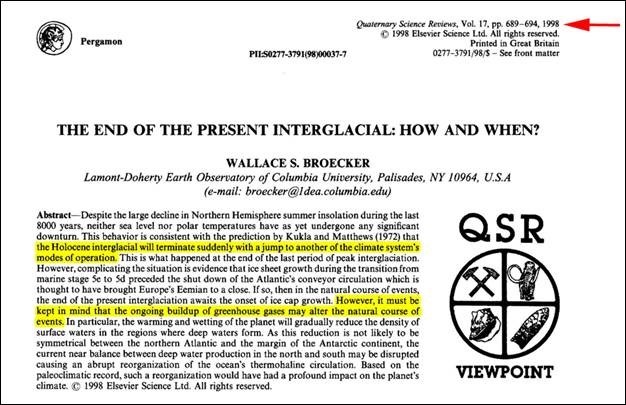 If the "early anthropogenic hypothesis" is correct, and the CO2/GHGs/etc./AGW hypothesis is correct, then removing said "climate security blanket" from the late Holocene atmosphere would favor glacial inception then, right? So glacial inception is to be preferred? Did ~97% of "us" just bump "our" heads? Necessarily, if the CO2/GHGs/etc./AGW hypothesis is not correct, what will removing CO2/GHGs/etc. accomplish with respect to climate change? To be considered responsive (serious et al etc. ), comments must take the mass of research sampled here into consideration in replies. · Even on things which actually have happened the science is not that particularly well-settled, which makes consideration of the science being settled on things which have not yet happened a bit unsettling. Another patent logical absurdity. · The IPCC estimate of the forcing which is estimated to accompany a doubling of atmospheric CO2 concentration is something like 3.7 watts per square meter, if memory serves me correctly. Suffice it to say it is somewhere between 3 and 4 W/m2. Again, if memory serves, this may be related to the top of the troposphere, precisely where in relation to the poles this might be I must rely upon others to provide. "However, the June 21 insolation minimum at 65N during MIS 11 is only 489 W/m2, much less pronounced than the present minimum of 474 W/m2." Glacial inception during MIS-11, with sea level running for thousands of years about +21.0M amsl, occurred with an arctic circle (65 degrees North) insolation some 15 W/m2 above their reported present Holocene minimum of 474 W/m2. If there is a logical absurdity here, and I would appreciate well-considered feedback on this point, then the AGW signal of between +3 to +4 W/m2 at 65N (top of the troposphere compared to ground at 65N) would get us to only 11 W/m2 below the insolation value where glacial inception occurred during the longest known post-MPT interglacial. I could very easily be wrong on this one, but it seems to me that whatever and at what level our AGW "signal" is calculated to be at 65N it would need to at least exceed the insolation value during the MIS-11 to MIS-10 glacial inception. If not, this is nothing but a silly-buggers game isn't it? Finally, would what remains be evil? (Which can apply to the entire spectrum between intelligence and the lack thereof) As demonstrated herein, the peer-reviewed literature is robust with respect to investigating possible/probable end-Holocene climate scenarios of "biblical" proportions with respect to the worst case AGW hypothesis and the most recent end extreme interglacial climate "track records". If you were aware of the vast literature (which the lengths exposed here are but an abbreviated taste) addressing the ~1 to ~2 orders of magnitude larger glacial inception "gorillas" with us here in the now half-precession old Holocene climate change room, and the climatic "madhouse" that such represents, and failed not only to inform us of this possibility/probability, but further failed to critically analyze/publish on it/IPCC-it, how might this not be considered evil? At the possible/probable end of the most recent extreme interglacial, our most advanced hominid/technological state ever, would this not comprise the simplest of intelligence tests? "Half the work done in the world is to make things appear what they are not." "If you torture the data enough, nature will always confess"
"97% of everyone have experienced AGW gases. The rest await the privilege....."
Lots and lots of information here. It's no wonder that nothing is 'settled' even though we are due for an ice age. Quote from article: "The entire non-debate on anthropogenic climate effects has always struck me "as two fleas arguing over who owns the dog they are riding on" (Crocodile Dundee). One of the required paradigms of AGW is patently ignoring "when we live" (ignorance of signal to noise ratio, or SNR)." invest in silk long-underwear, wool coats, and canned meat while the dollar is still worth something. Wow, that was a long one! The eyes seemed to prefer sleep as the data was a little dense and overwhelming while being repetitive in showing the alignment of interest of those actually doing the research. Interglacials only last so long and we are overdue, perhaps due to 'man-made global warming', and if so, we should keep up the good work as long as possible to prevent sliding quickly back into the ice age we slipped out of. Mr. Gore failed to mention all this good work human industry was doing for us, so why does he and his friends want it to stop? Do they seek our death? Or just their own and we are just along for the ride? Abrupt climate change may be caused in many cases by punctuations from the heavens. What most of the above may detail is the Earth's struggle to return to equilibrium over time after sudden comet bombardment.